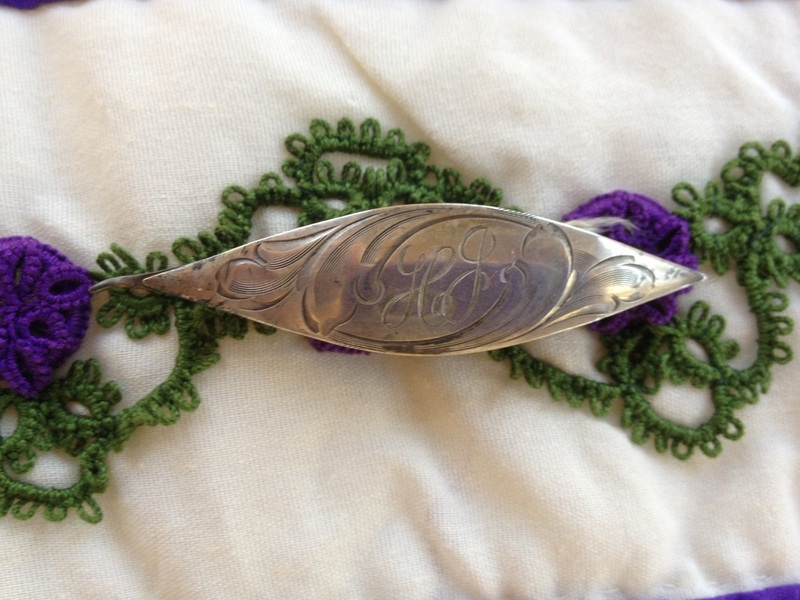 Before 1840 there were no silver factories in the USA, everything was ordered directly from silversmiths. The Tariff of August 1842 caused tax on imported gold and silverware. This started Unger brothers, Tiffany Company, Webster and more companies here in USA. The sterling mark came into use after 1857. Simons Bros. did not give names to their designs, but instead assigned them numbers accompanied by the description(see below example.) 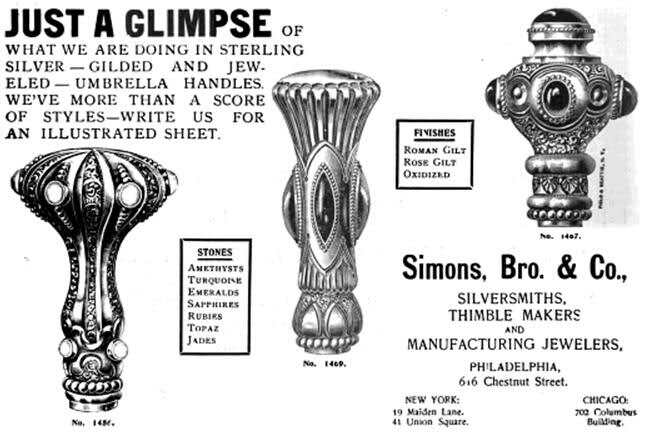 Simons Brothers was the leading thimble manufactuer. In 1927 they bought the thimble part of Waite Thresher Co. of Rhode Island. 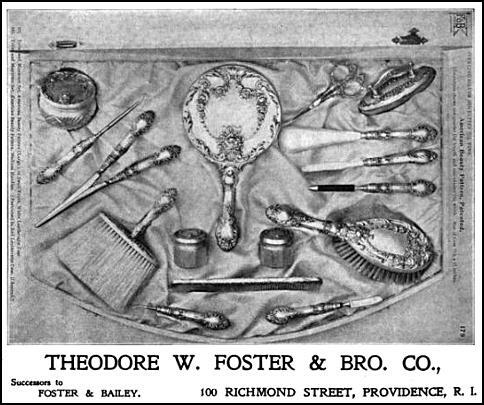 Silver factories emerged in the USA North Attleboro Factory (Webster Company), GK Webster began manfacturing silver items in 1879. Webster later became Reed and Barton from 1950's- 1970's. Simon Bros. & Company is well know for it's silver and gold items. George Washington Simons was born in 1819 and started his business in 1839 in Philadelphia. 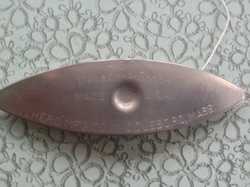 His brother Peter B. Simon joined the company late, they made a variety of items. The brothers had a contract with the military during the civil war, they were famous for their military swords. The United States Naval Academy and Pennsylvania Historial Society have their swords. The Company was given several awards for their fine workman ship and finish products. This shuttle is unique in the fact that it is heavier than Foster & Bailey shuttles. Another unique feature is it has double posts to wrap your thread around.The silver used by the silversmiths is heavier. It also has 2314 after their trademark. Mike with Simons Bro & Company informed me that was the style number not the number that was made. Christopher E. Papadakis of Philadelphia wrote the following history of the shuttle.
" 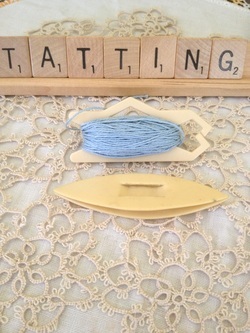 I purchased the tatting shuttle 2 weeks ago from another dealer who was retiring (late 70's age). He had inherited it from a close family friend or aunt decades ago and kept it all this time." This was a Birthday gift from my mother, it's been a while since I have posted. My Mother's health is declining with breast cancer, so this shuttle is very dear to me! 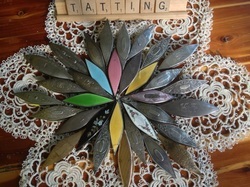 Fish Tatting Shuttle- Simons Bro. & Co. The sterling mark came into effect after 1857. Simons Bro. & Co. assigned numbers to their designs. 2314 would have been the double headed tatting shuttle. It appears that Otto Stumpf & Co. sold their items. Simon Bro. & Company had an office on State Street in Chicago Illinois. Simons Bro. 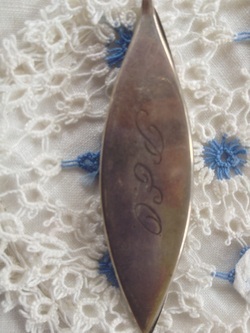 & Co. was the leading thimble manufacturer company in designs of unique thimbles. 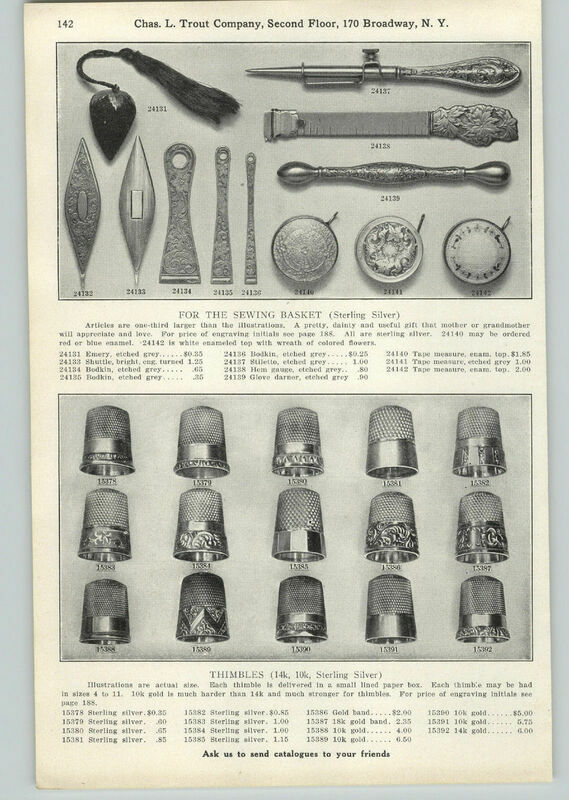 They sold other items, but are know for their thimbles. Updated 2-12-19 "The one that got away"
items were ivory. I wanted to share this, it was to be a Birthday gift from my mother. Update 4-3-17 " Very Unique Shuttle Design"
This was my birthday present to me. I so enjoy the hunt and more especially the find! It was a great day had a blast making memories with Mike. This shuttle is either gold plated or brass. 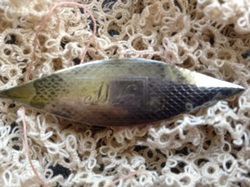 I am not sure it came out of a button and thimble collectors estate that is what Katie the owner told me. I plan on having it tested at some point. I am fully aware of the damage to the end of the shuttle, however it will make a great home in my collection. I could not pass this shuttle up. I have passed on some that I have never seen before, only to regret not purchasing them later. ​I will have to do more research on this shuttle when time permits. I have attached a picture below of some unique ones. 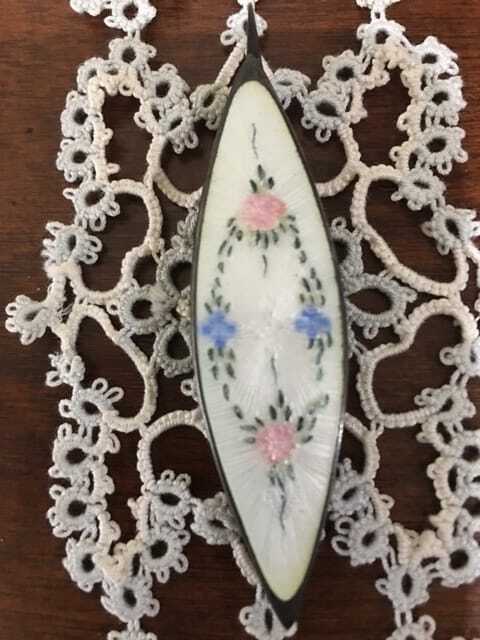 This little antique mother of pearl tatting shuttle has a mother of pearl post and is inset on both sides with oval gold cartouche. 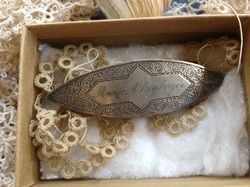 Both sides are engraved with a leafy scroll border. 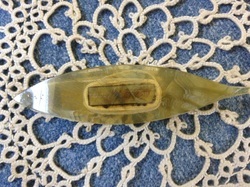 It measures 2 1/2 inches long by 5/8 inches wide. The condition is excellent with no chips or cracks. 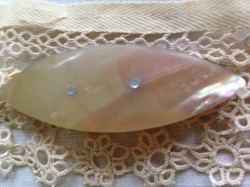 The mother of pearl is very luminous. The Palais Royal was an arcade of shops within a wing of a former Royal Palace in Paris. The shops opened in the late 1780's and housed the finest French artisans selling only the highest quality goods. 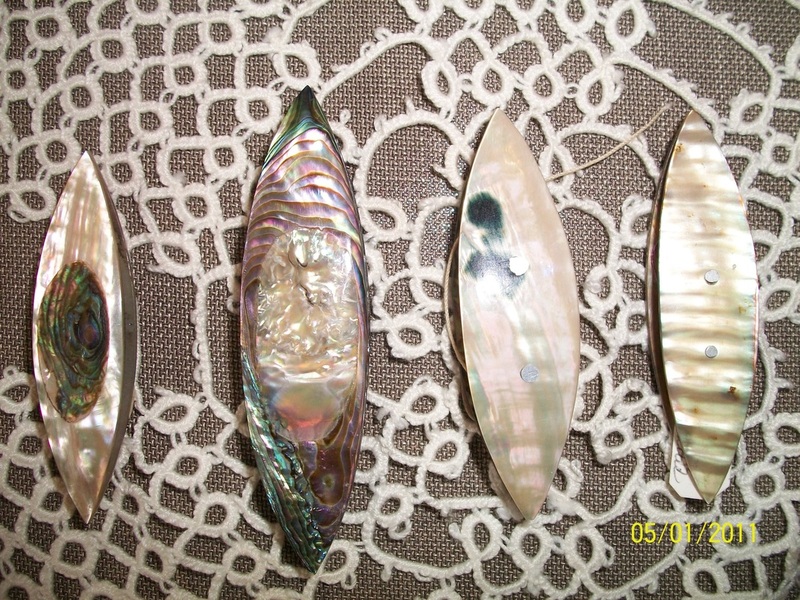 Items of mother of pearl and precious metals were specialties there. French needlework boxes appeared around 1790. 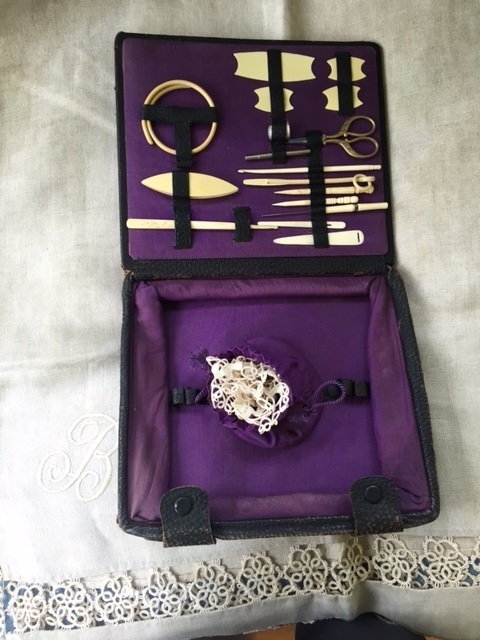 They had several sewing items neatly displayed in the boxes. The most recognizable of these French boxes are the so called Palais Royal sets.They came from the shops and were popular in the America. They were costly and largely owned by the wealthy. Surviving sets with carvings are rare. It came from Midlothian, Virginia in the United States. I wonder who owned this lovely piece and what kind of items were tatted with it. This was a wonderful Christmas gift! 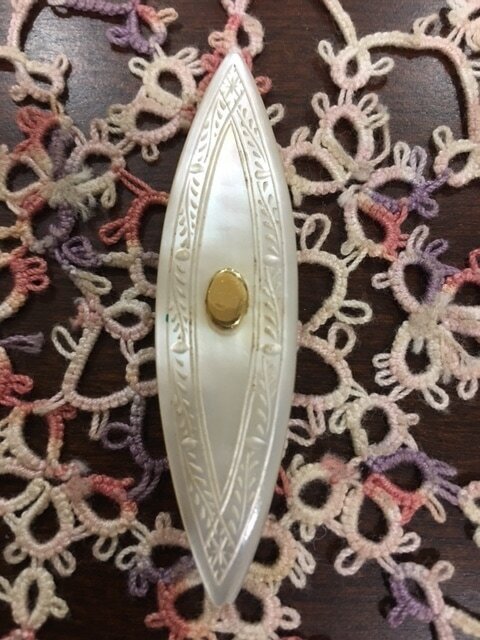 Here is example of Palais Royal Mother of Pearl Knotting Shuttle that is up for auction. Updated 3-12-17 " Donna's Shuttle"
Here is a wonderful shuttle purchased from Donna. Here is what she had to say about this shuttle. " 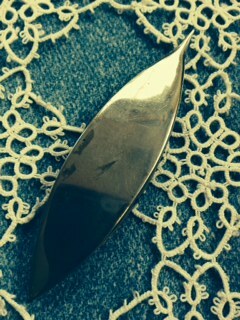 While traveling in 1970's through New England I purchased this at Antique Show. 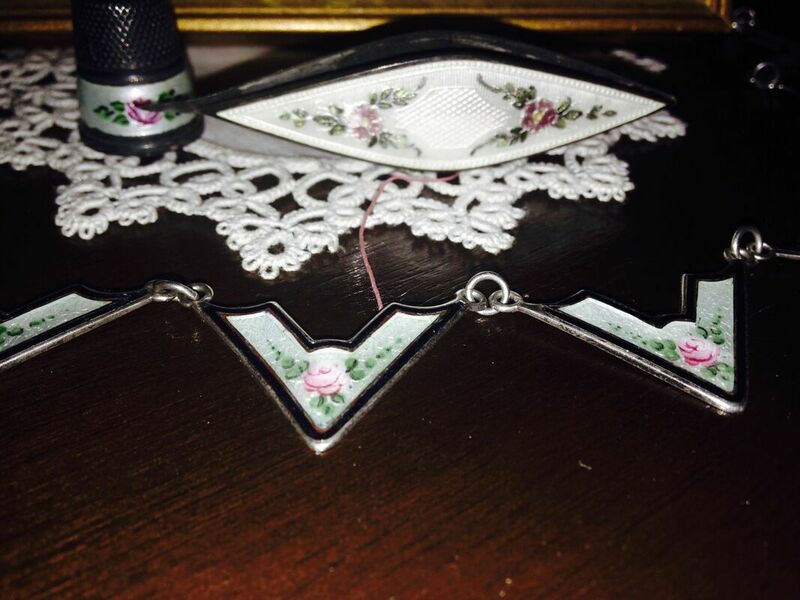 My mother had always done tatting and it reminded me of her. Precious hand painting just made it extra special." " It has been tucked away ever since. Never used, just enjoyed all these years." This shuttle belonged to Bettie A. Brodhead, wife of of Col. John C. Brodhead. He was a civil engineer and chief engineer of the Cumberland and Ohio Railroad, Churchill Downs, and the Muldraugh's Hill tunnel on the L&N Railroad. 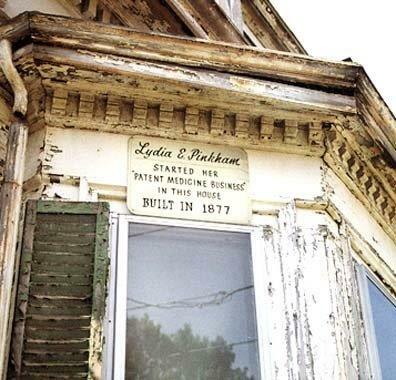 Bettie and John lived in Louisville, Kentucky in the mid-late 1800's. This shuttle has been in the family of Sally Lauver for years. 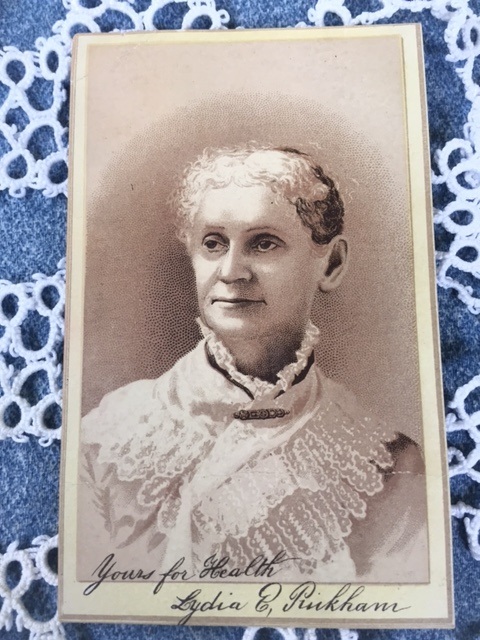 Bettie Brodhead was her great-great grandmother. I was granted permission to publish the history of this shuttle by her family. This shuttle is one of my favorite shuttles in my collection. It was a Christmas present from Mike this year. 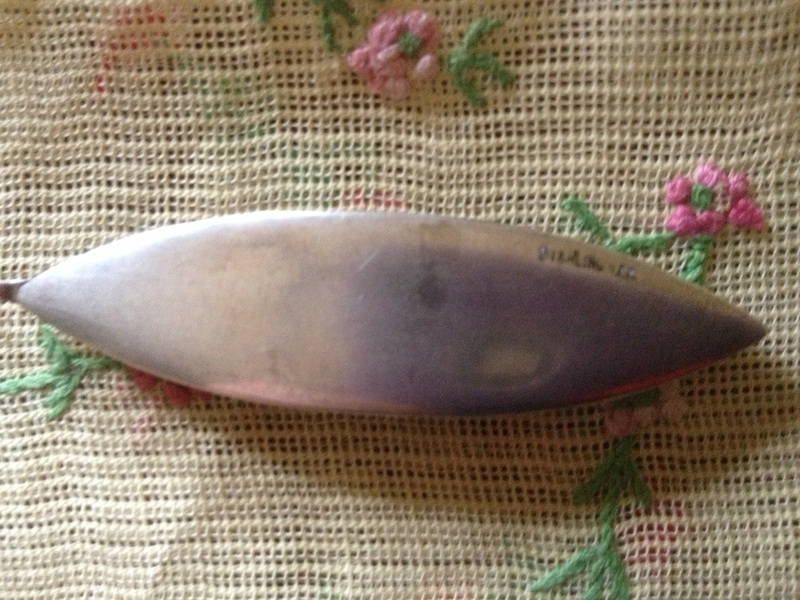 It is a sterling enameled shuttle, with the markings of Webster & Company. This picture was sent to me by Sally Lauver this year. 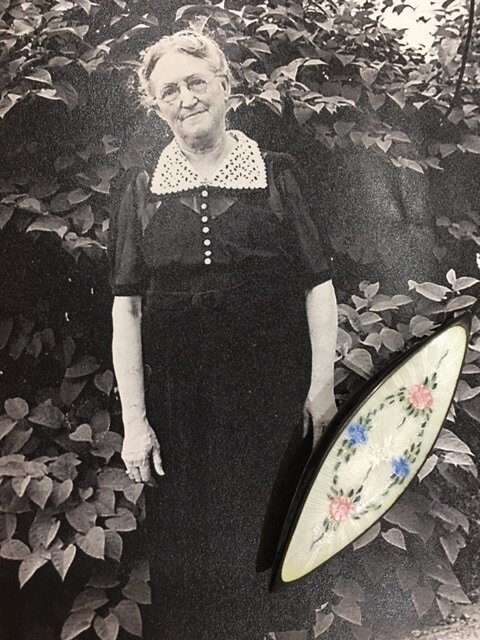 This is a picture of Bessie Dalrymple, Sally's great grandmother. Bessie's mother, Bettie, is the original owner of the shuttle. Bettie died in 1918 and Bessie died in 1948. Up until my husband purchased it in December 2016, it belonged to this family! I'm honored to keep their family history alive through this documentation. This shuttle is currently up for sale on E-bay! Wow! It was made by A. 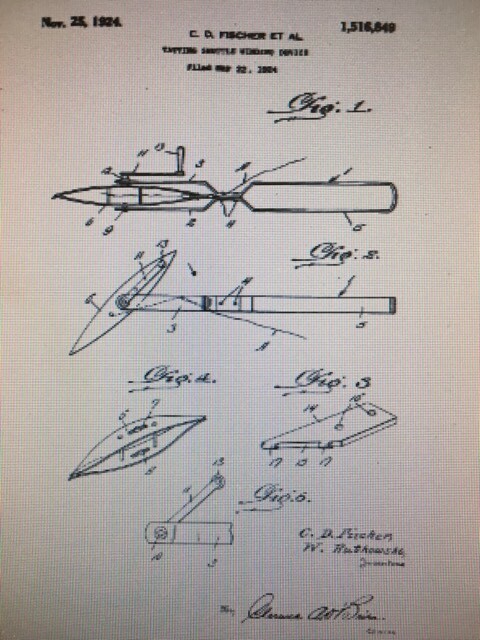 B. Greenwalt and was patented on January 1, 1867. The shuttle has a retractable point. The other side of the shuttle has a floral design with patent date on it. This is the first time I have ever seen this shuttle for sale! ​I would love to know the history of this shuttle! Anyone have a shuttle like this in their collection? If so I would love to hear from you, this is what the prior owner had to say about the shuttle. I received your card regarding the tatting shuttle. I wish I had information on it for you other than I purchased it with more shuttles and some tatting thread at an estate sale in Idaho. The other shuttles are very old as well, some in a box from Germany. I am guessing more than 100 years old. This shuttle was my 29th Anniversary Gift! My Husband said "It came from antique dealer in Kansas." It's amazing, I've never seen one like it before. 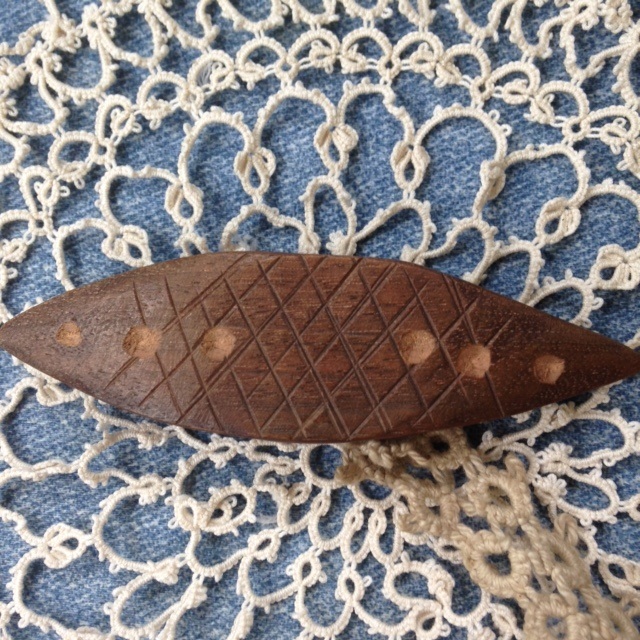 It's all hand carved, the front has 6 dots the back only has 5 dots. 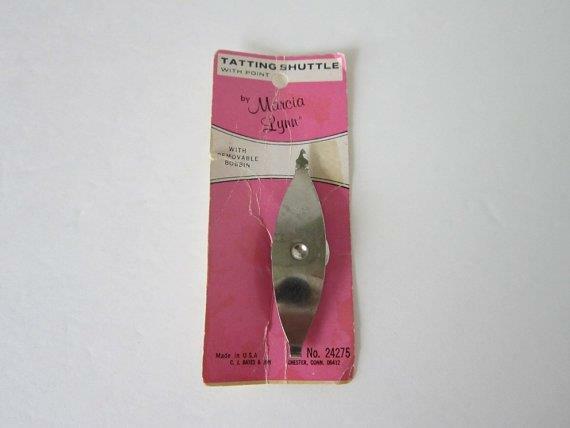 I wanted to share the tatting shuttle that started my obsession with collecting them. 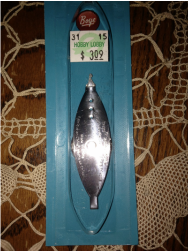 I purchased this shuttle on 11-20-1999 from Skowhegan, Maine for $84.00 dollars. 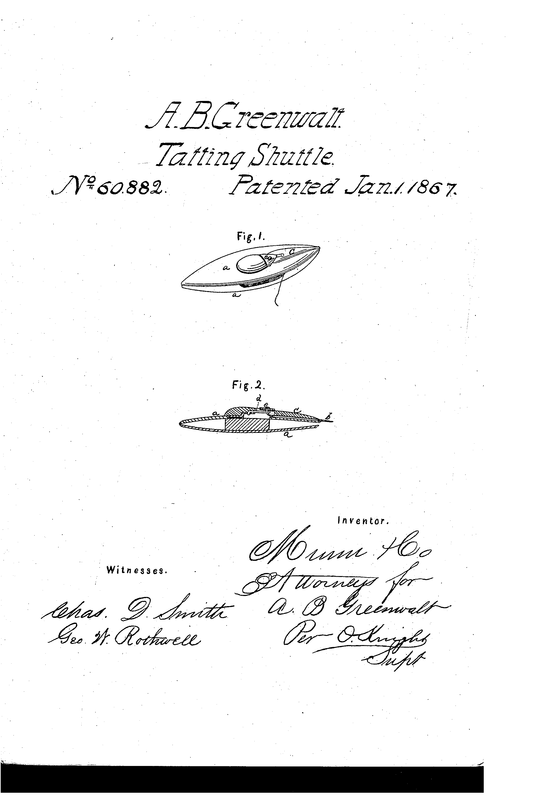 This shuttle was patented August 4, 1868 by Ira H. Stockwell and Lizzie Goodwin of Worcester, Massachusetts. I did not requested any history of this shuttle when I purchased it so, I do not have that history to share. 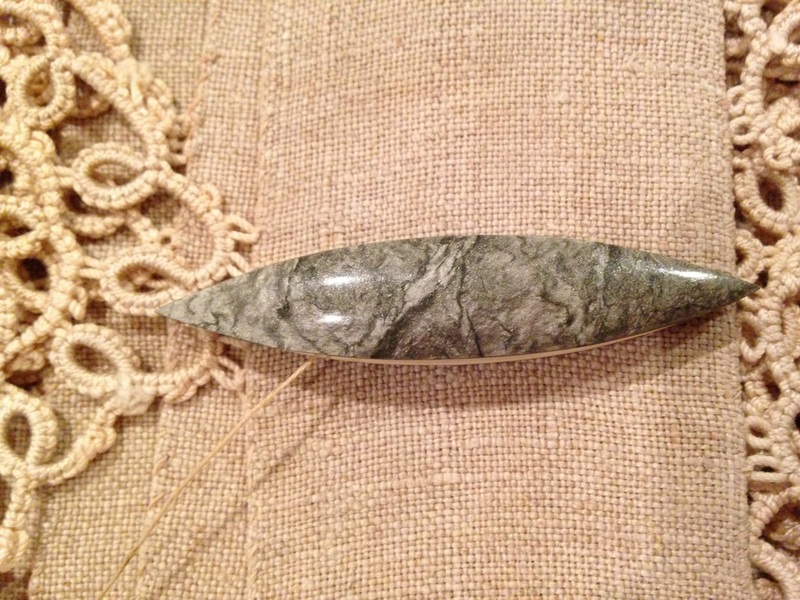 Knotting shuttles were popular in 1700's to late 1800's. 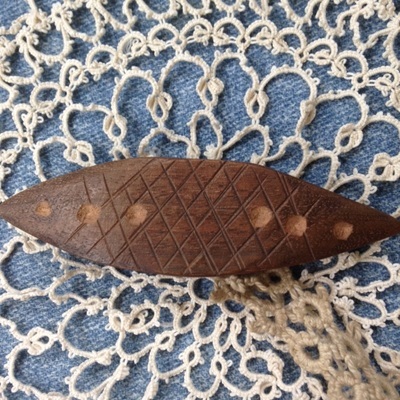 Their are a number of literary references to Knotting if you research them..... Knotting shuttles are more oval and the ends of shuttle do not touch. 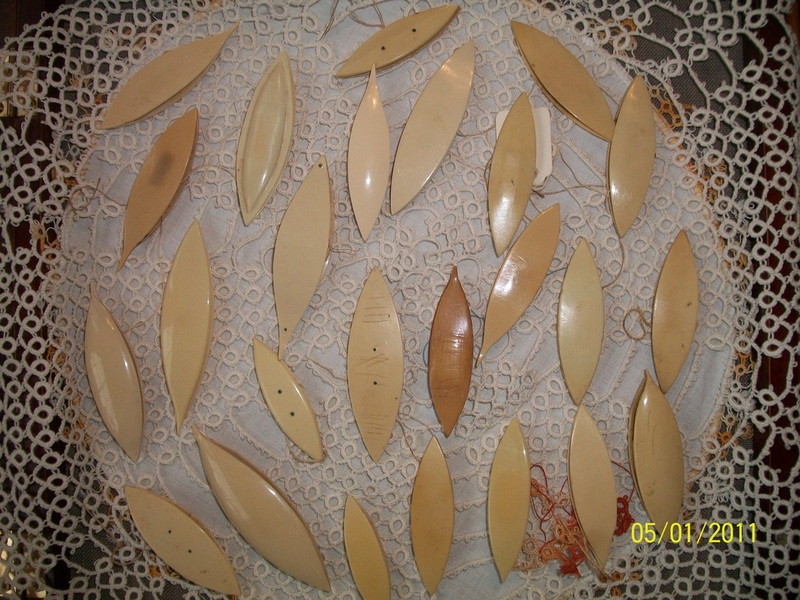 Knotting shuttles were made from ivory, tortoiseshell, mother of pearl. 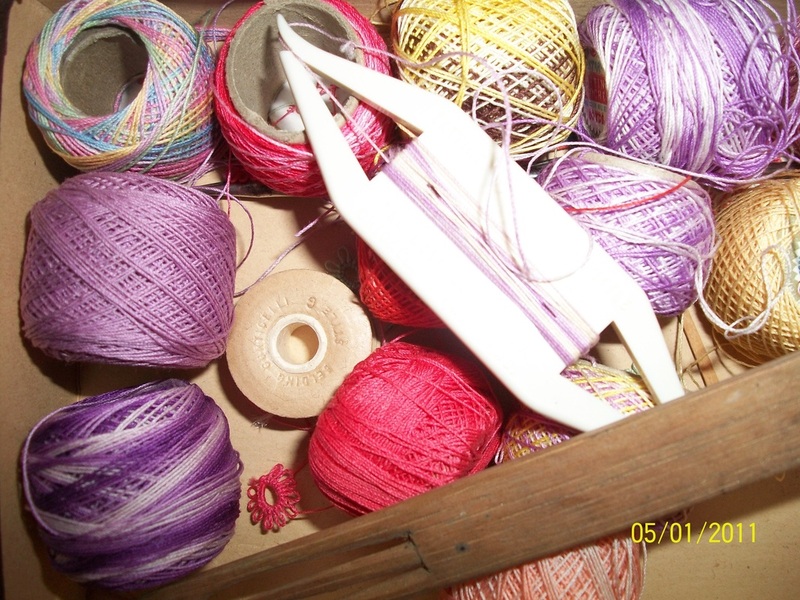 By the end of 1800's knotting had declined due to the need for more light weight materials. 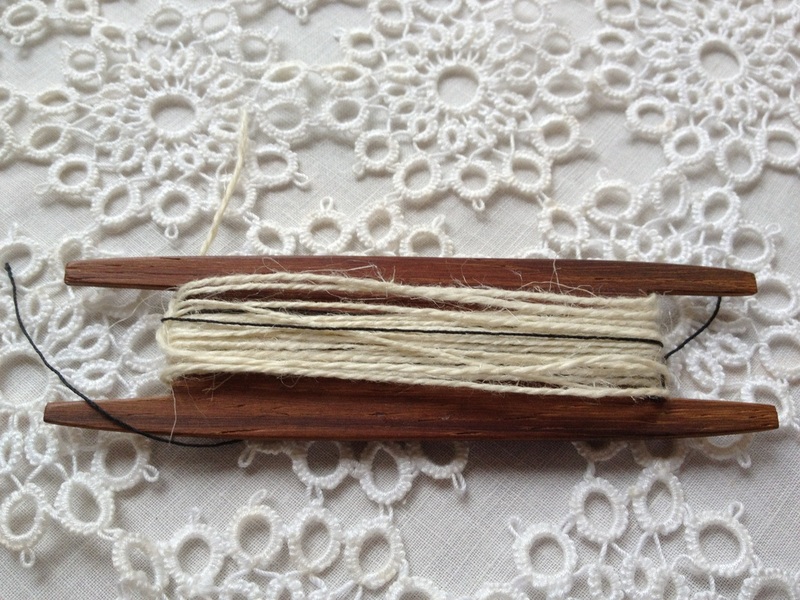 Knotting shuttles are larger than tatting shuttles. If you find pictures from 1700's and 1800's you will see the ladies with a larger shuttle in their hands. 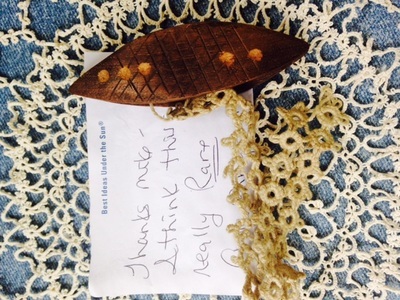 In my research I found that knotting seem to pave the way to tatting. I do believe the shuttle that is for sell on e-bay is made of tortoiseshell. 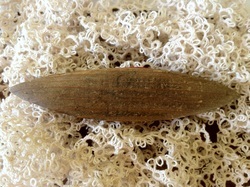 I do not own any knotting shuttles in my collection, just wanted to document the history. I found that a shuttle like this sold on E-bay on 2-27-2001. 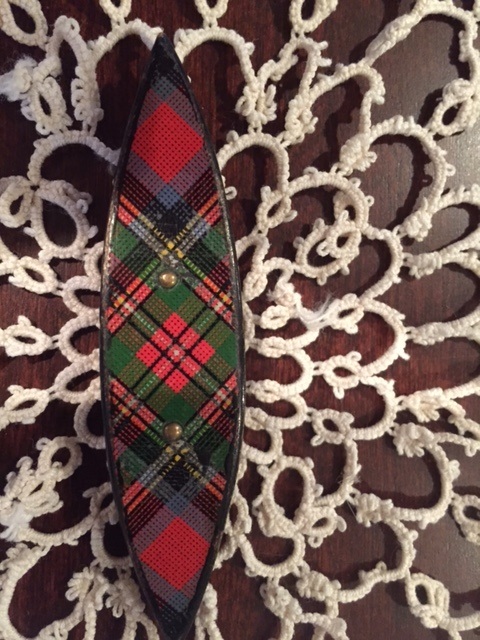 According to worthpoint.com, it is a McDonald Tartan Ware Tatting Shuttle C1870. My husband purchased it from Craig, he said it was not a McDonald. I would like to do more research, if you know the answer please e-mail me. patent seal for the process. The patent is for the invention of a pantographic machine for printing tartan onto paper. This invention lead to the souvenirs of Scottish views like that of Robert Burns's Cottage, and other tourist destinations in Scotland. From 1864 to 1885 there were three "Box Works" in Mauchline: W.& A. Smith, Wilson & Amphlet and John Davidson and Sons. 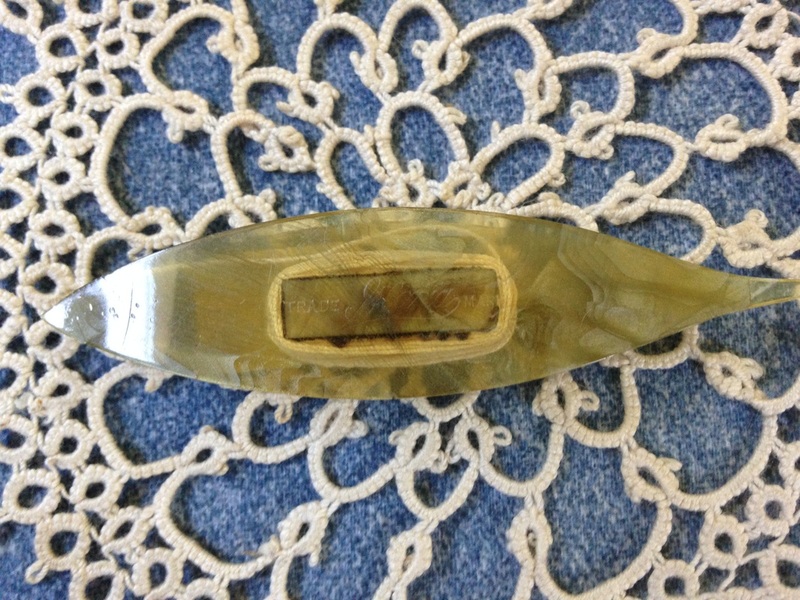 They made a variety of items such as needle cases, snuff boxes and cigar magazines. 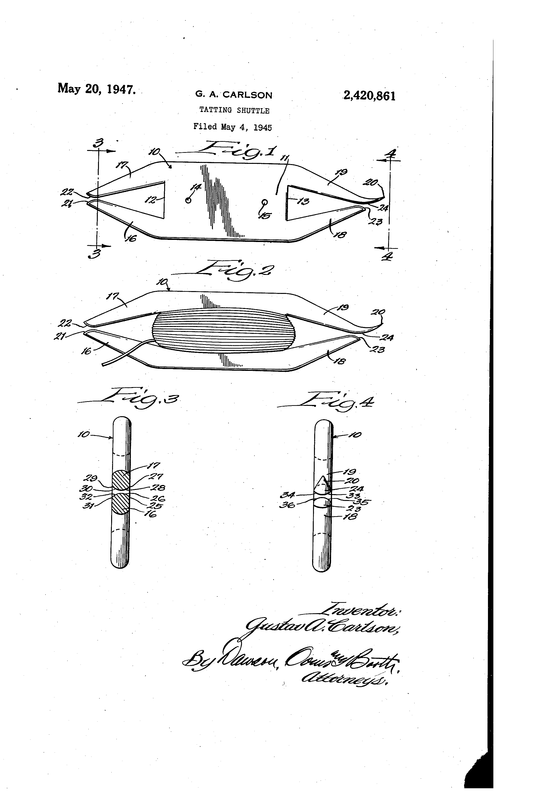 John Morrison and Samuel Amphlet had a patent in 1865 for fastenings for belts. A fire in early 1920's's destroyed the tartan machines and stopped the production. A second fire in 1933 caused William to sell the company to three local men, W.&A. Smith 1937 Ltd was formed. The stock and machinery were sold and the name W.& A. Smith disappeared. The Mauchline shuttles were made from Sycamore wood. Scroll down to the bottom to see my Mauchline collection of shuttles from Scotland. 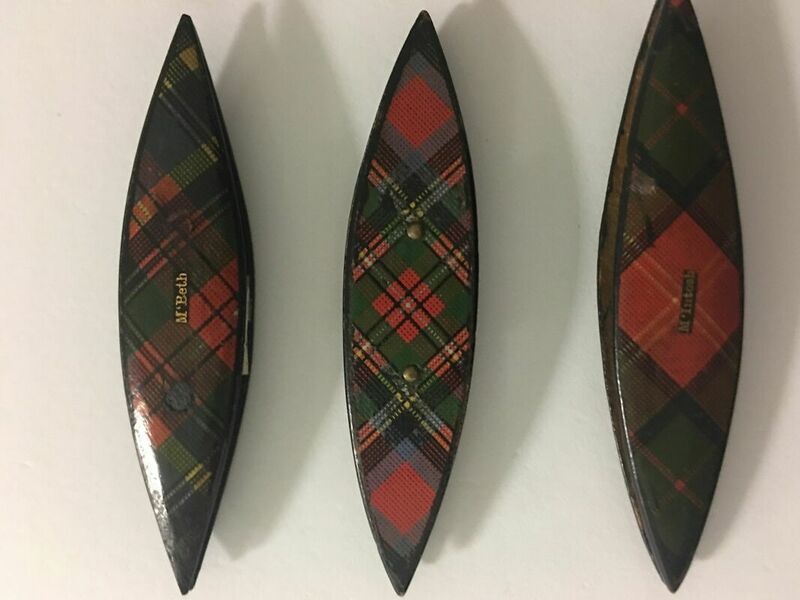 They are made from sycamore and decorated with scenes from Scotland. made by Mackenzie & Meikle of Caleodonian works in Lanark. Schenectady, New York. 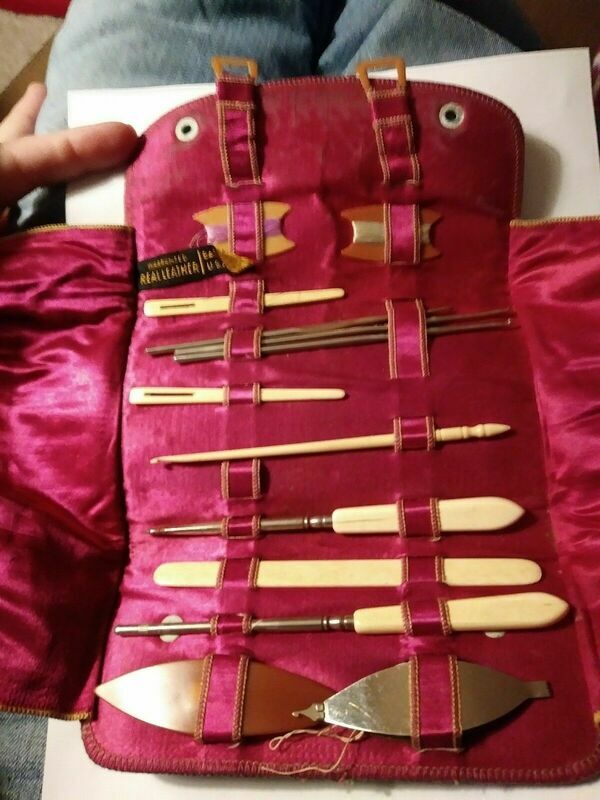 She said there were many unusual antiques items at this sale and she was lucky enough to get this kit. 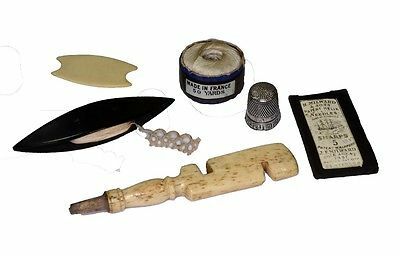 I have seen several different sewing kits with tatting shuttles, bodkin, stiletto, scissors and crochet hooks. 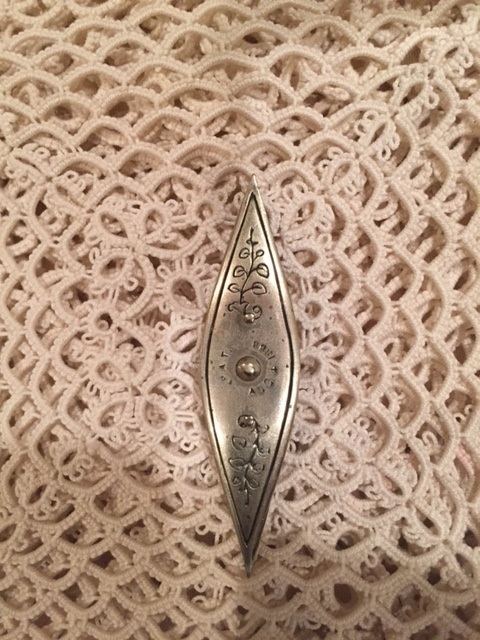 I don't know the age of it, however it has many clues. 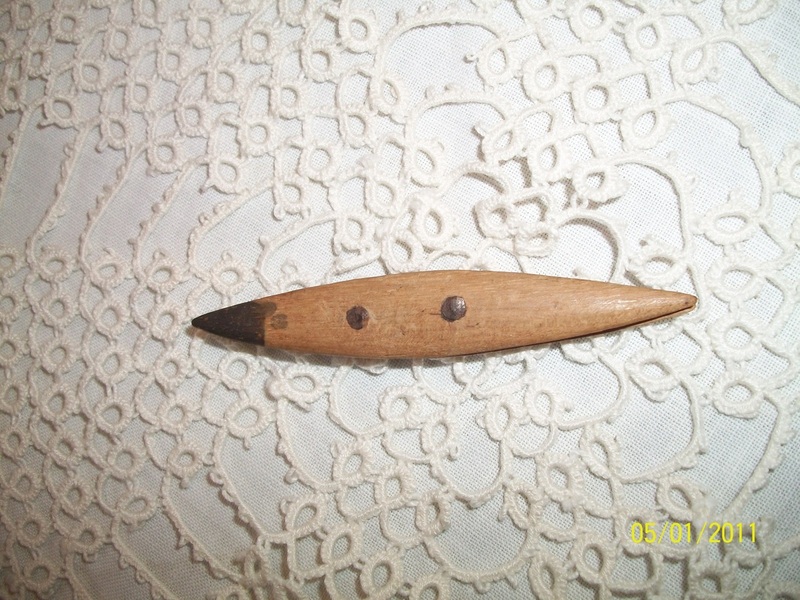 One clue is the Mildward Cleopatra Crochet Hook, it also has scissors that are marked with A&L Co Germany. 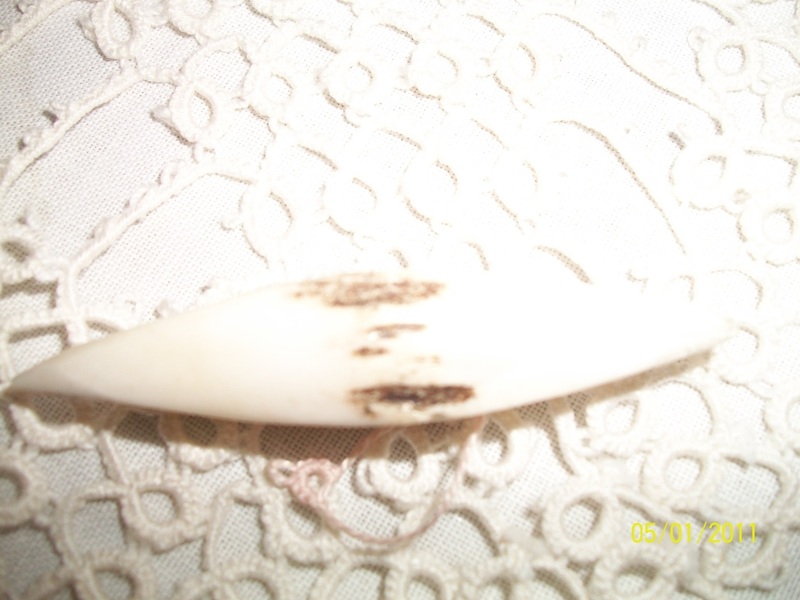 It contains items made of bone and celluloid. 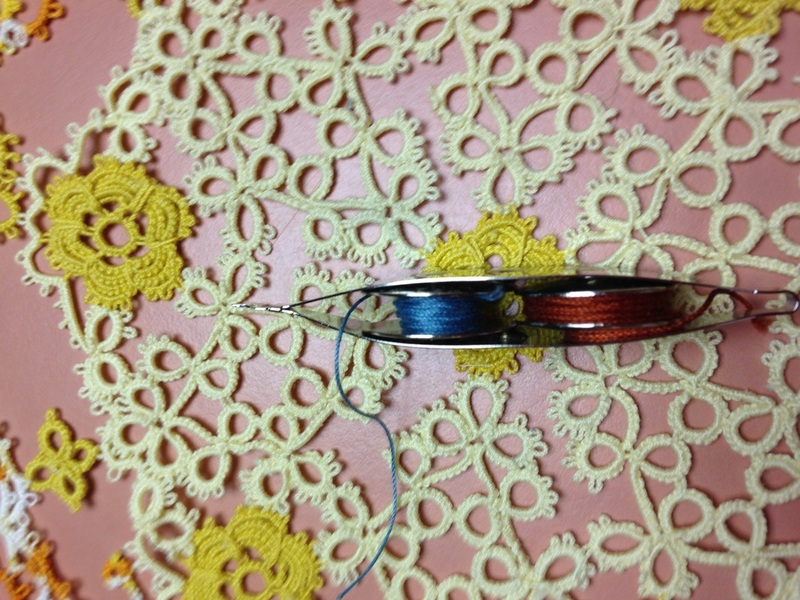 You can see the celluloid wristlet that would hold your ball of thread while you tat. 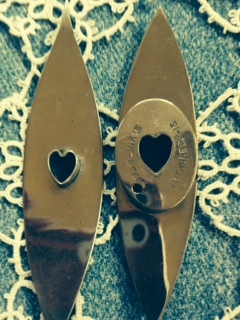 If you know the maker of the Scissors marked A&L Co Germany please e-mail me that information. Pictures from 1916 shows some needle working tools. 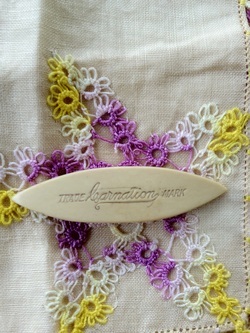 Did you notice the Mildward Bone Cleopatra Crochet Hook? Coats & Clark in the USA recommended Mildward until 1942, then it suspended needlework for the war efforts. 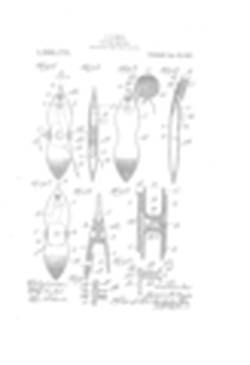 Warner patent of November 1865, this patent was before the first tatting shuttle patent. (Mildward's Needles) in the 1730's in Redditch ,United Kingdom. with companies continued. They took over Abel Morrall's Aero Needles in 1989. Mildward owned may companys, each retained their own trade mark name. In 1973 they purchased Coats Patons known as Coats PLC Needle Indrustries. from 1932. They stopped making crochet hooks in 2012.
the cartel guilty. 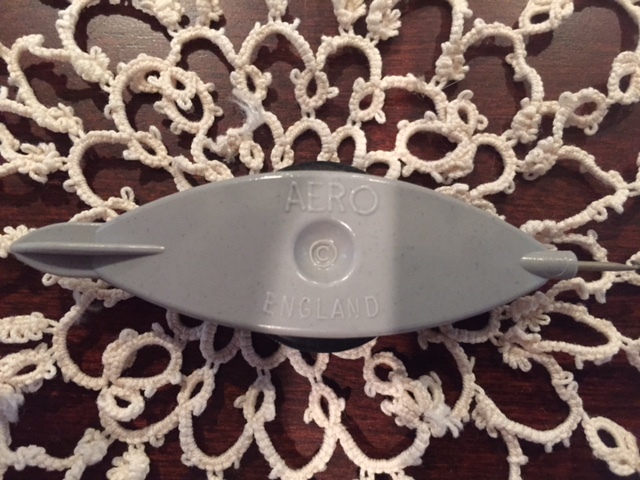 In 1995 the AERO brand went to Prym. Mildward shuttle is no longer made in England, but can be found USA. Check out Jane Enbroll's Blog dated June 25,2012 and July 5, 2012. 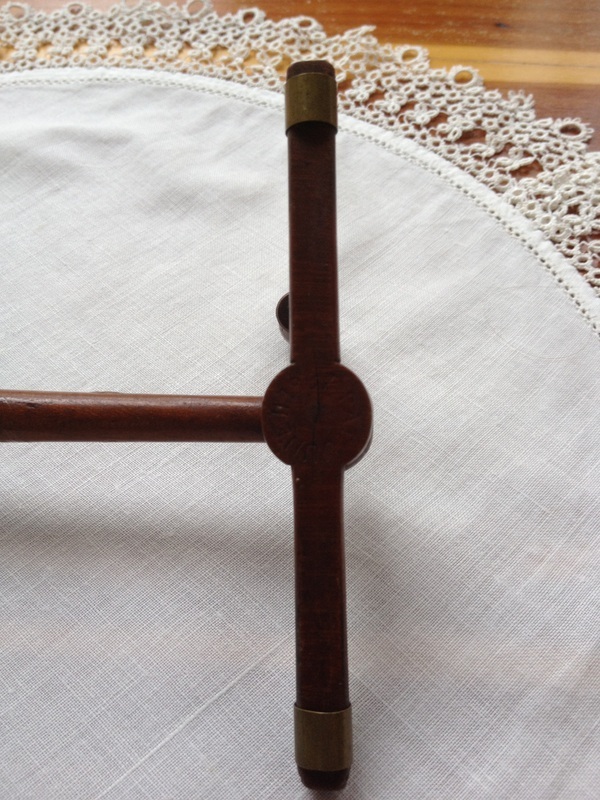 Here is an example that sold on E-bay of H. Mildward & Sons Needles. Handmade shuttle I love the wood-grain in this shuttle. This shuttle recently sold on E-bay. You guessed it, the shuttle maker is from North Attleboro Massachusetts. This shuttle was by: R. Blackinton & Company. The company was founded by Walter Ballou and Roswell Blackinton in the 1860's and remained in business until 1967. They were known for a very high standard in sterling and gold. Their trademark was "B" with pierced by sword. This is another picture of Webster turned engine shuttle. Cassandra the dealer who sold it informed me that in 1950 it became Reed & Barton Company of Massachusetts. I encourage collectors to ask as many questions as that is how you find out information. Webster Company of North Attleboro, Massachusetts was founded by George K. Webster in 1869. 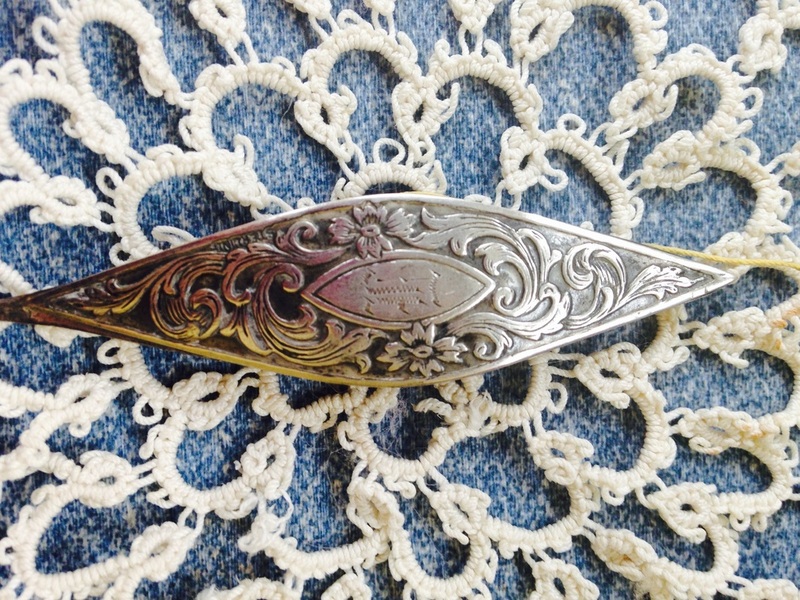 Ownership changed in 1958 George K. Webster Silver Company became a subsidiary of Reed & Barton. Scroll down to my Leach & Miller Shuttle to see History of this company and another example of Leach & Miller shuttle that is not in my collection. I have found out this shuttle was made by F.A. Hermann of Massachusetts founded in 1908. This is not in my collection, however I posted about it in my blog dated 6-23-14. Update: "Pink" Shuttle is now in my collection. The picture below shows in detail of the front and back of the shuttle. This shuttle is not part of my collection just wanted to show another example of F.A. Hermann Shuttle. Update: This shuttle is now in my collection; but I still am searching for more information. The below shuttle shows the shuttle with a point! This shuttle is listed on E-bay. It is not part of my collection just wanted show the different colors to F.A. Hermann data base. I love all of his collection of shuttles. You find very little history of them. I do think his shuttles will cost you more than the average sterling shuttle. Tortoiseshell is the shell of the tortoise. 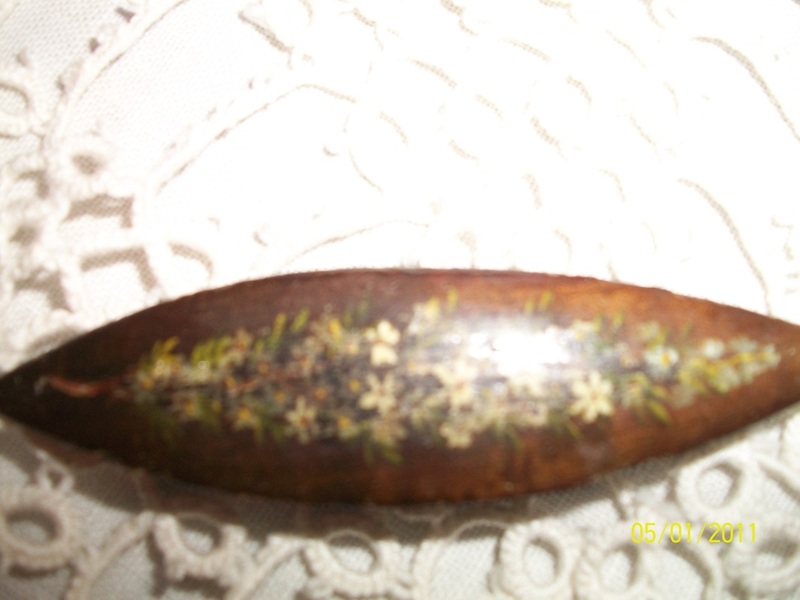 It has been used in inlay and to make decorative objects from the seventeenth century. Some species of tortoise were on the endangered species list in 1972. It's illegal to sell new objects made of tortoise. Tortex, a type of plastic has been accepted as a replacement for tortoiseshell since the ban of the natural material in 1972. 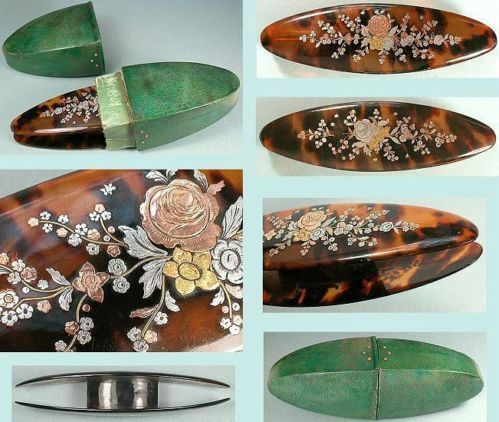 You may see items list as faux tortoiseshell. 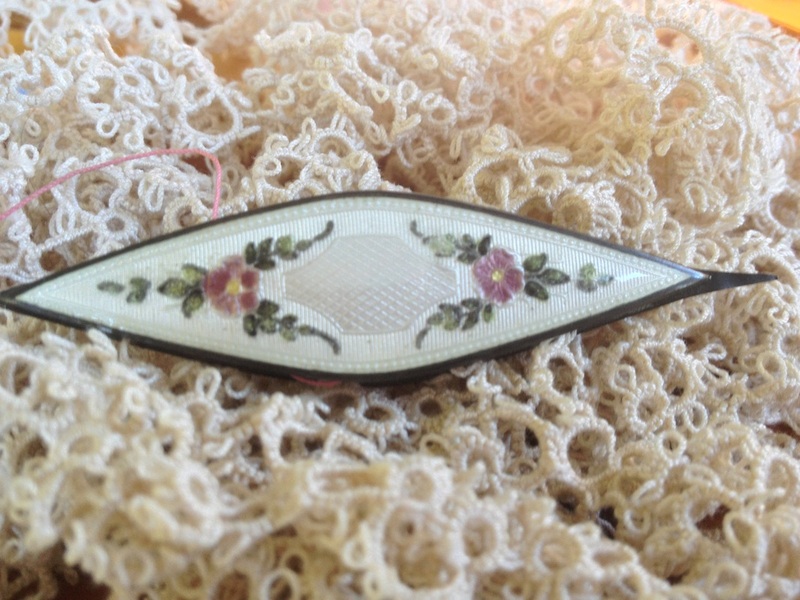 Tatting shuttles used in the 1800's were of bone, ivory, mother of pearl and tortoiseshell. This shuttle is beautiful when held to the light. 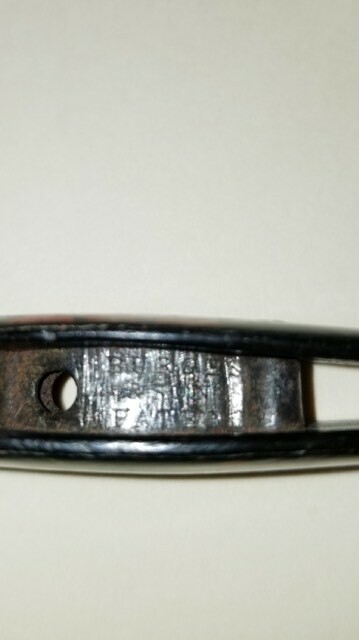 The rivets in the shuttle are also a clue to the age of this shuttle, the dealer sold it to me for $20.00. It came out of estate in Cape Cod, what a great birthday gift! 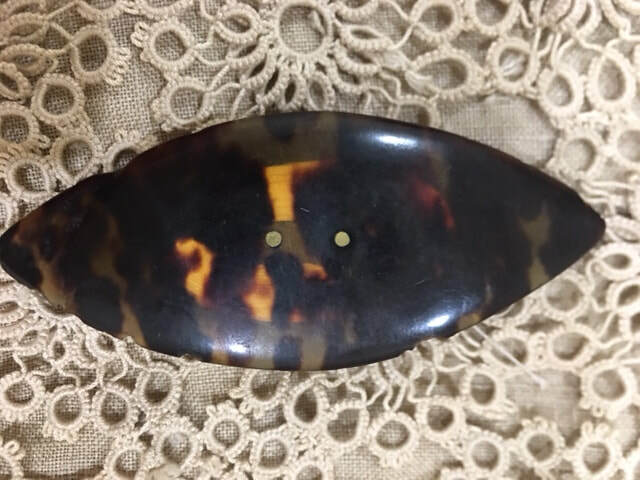 A dealer who later appraised it, said it was from 1880's and it was tortoiseshell. If she had this shuttle she would be asking $150.00 for it. 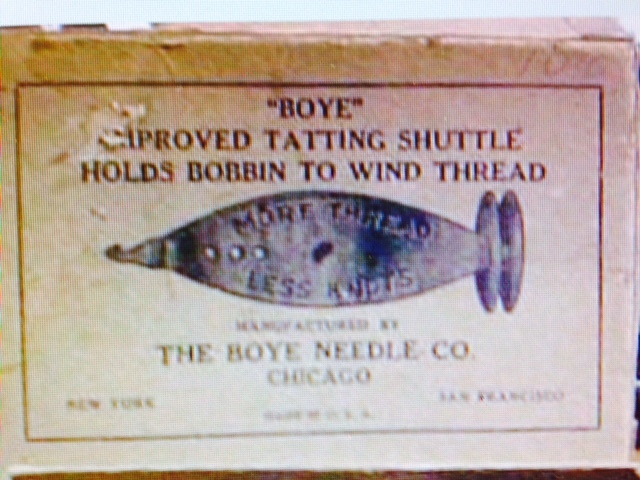 Box that "Boye" Improved Tatting Shuttles came in. 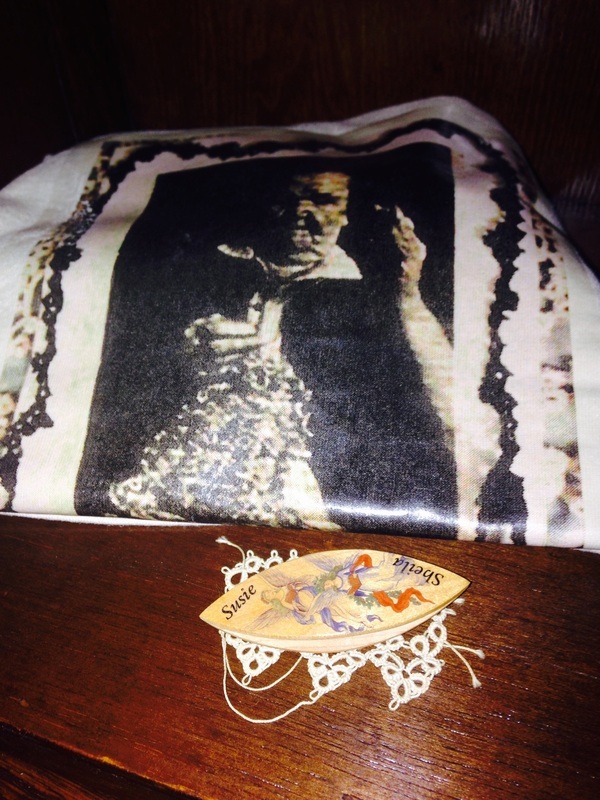 Susan Bates items below recently sold on E-bay. 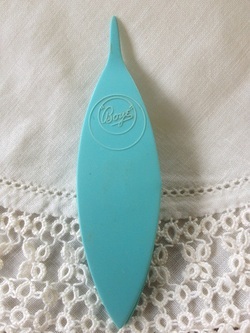 It peaked my curiosity so I am documenting the history of "Boye Crochet Hooks." According to Jean Leinhauser a Design Director from 1964 to 1971 for the Boye Needle Company. 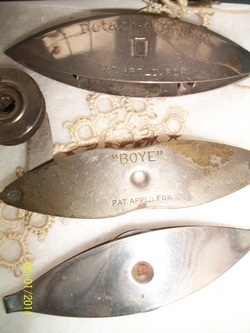 Boye was founded in 1906 in Chicago and was originally made drapery hardware and various sewing machine items. 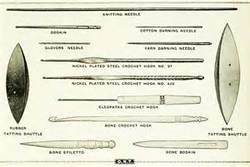 In 1917 Boye introduced the first complete line of steel crochet hooks made in USA. They made sizes 1 to 16, prior to that they were imported from England and Germany. In 1922 they added sizes C, D. and E to the steel hook line. 1923 they also F,G,H,I and J. During World War 2, all steel hooks production was prohibited by law for the duration. 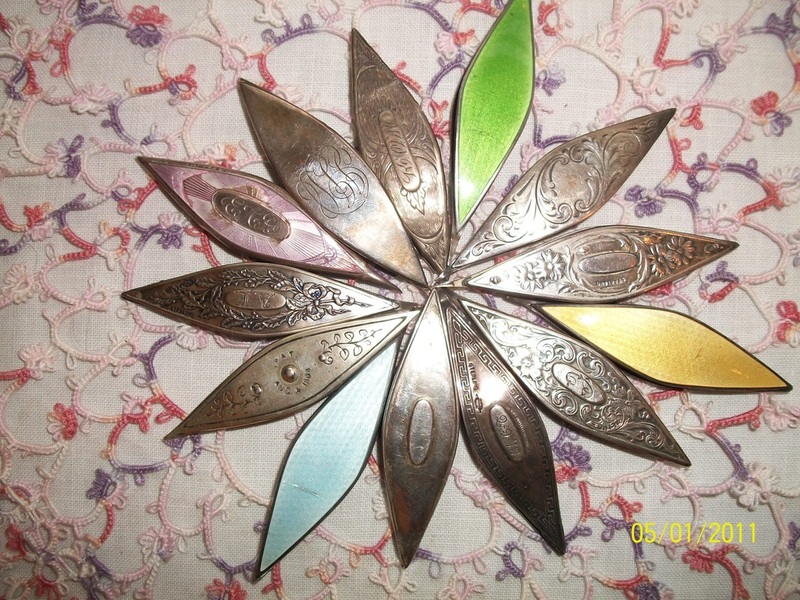 The colorful aluminum crochet hooks that were well know today was introduced in January of 1949. 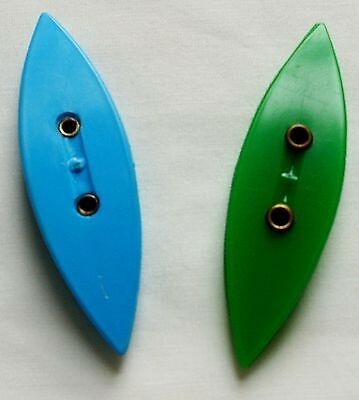 No Boye hooks are manufactured in the USA today. 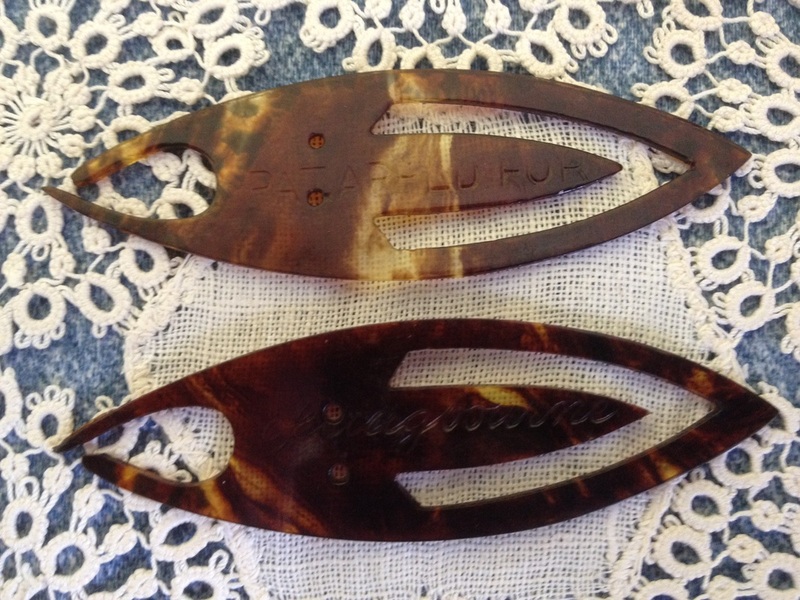 The larger hooks were not produced for many years and are more collectable today according to her. Now, to the picture below do you see what I see? This shuttle was a birthday gift from my mother. 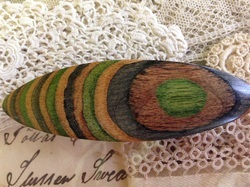 I have different colors of this swirl pattern. They made blue, red and ﻿green. Scroll down to 10-18-12 see my Boye baby blue shuttle. This shuttle was purchased to show that Boye is now made in China. The markings on the shuttle are different. 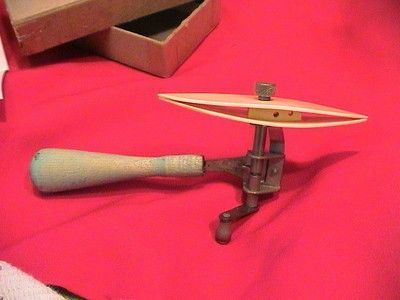 It's not an original "Boye" Improved Tatting Shuttle. 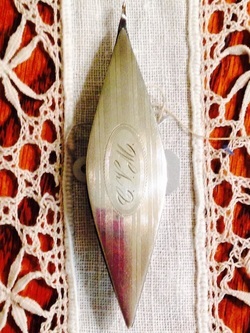 Tatting Shuttle Produced by C.J. 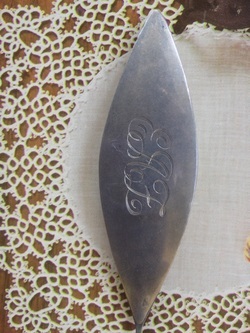 Bates Company marked " Susan Bates"
C. J. Bates & Son Tatting Shuttle Circa 1945 research becomes interesting. 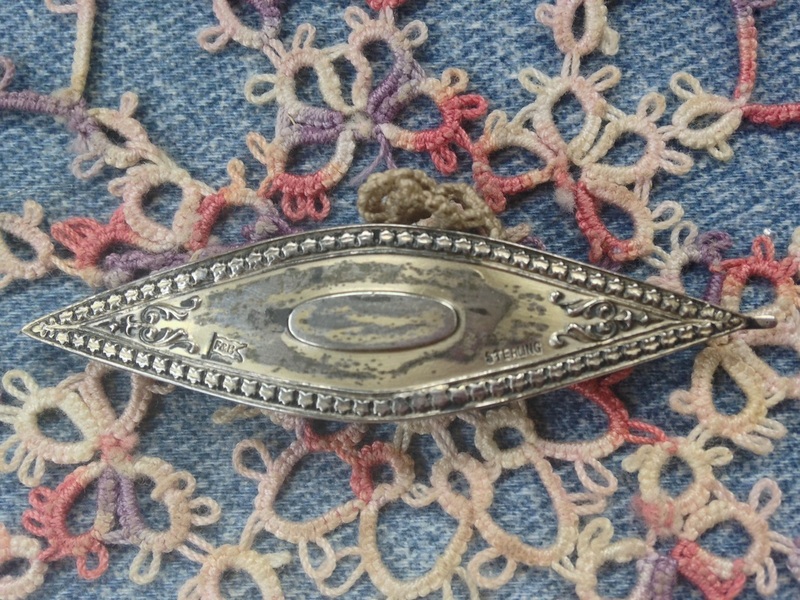 The Company was named for Carlton Joseph Bates, originally Bates needlework were unbranded with private labels. 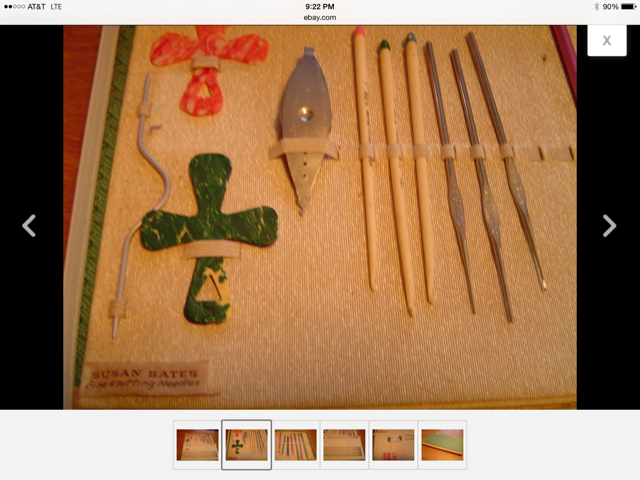 1971 Bates was the largest needlework tool manufacturer in United States. Bates begin using it's own brand name " Chester & Barbara Bates in early 1930's. Chester became Zephyr and Barbara was changed to Susan Bates. The Company was sold to Coats & Clark in 1993. C.J. Bates bought the business from Mr. Post in 1873. 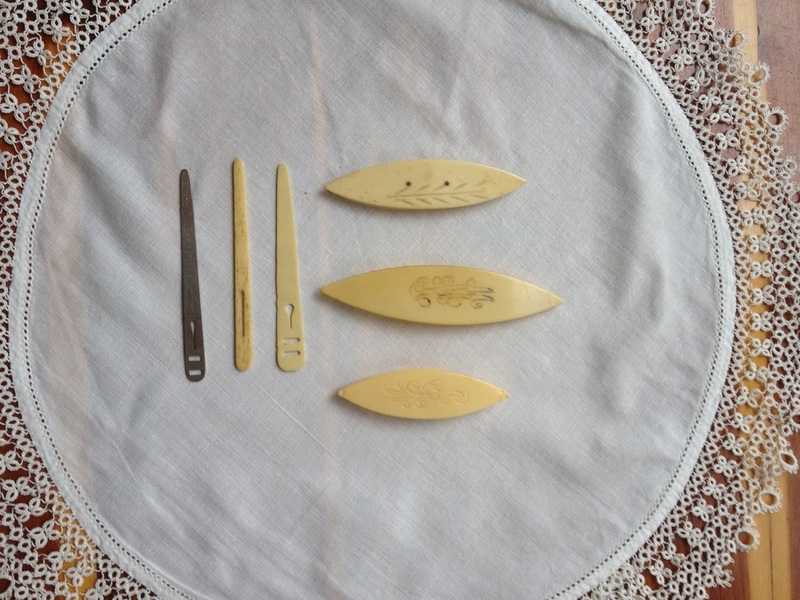 He continued to make small items such as crochet hooks, studs, bodkins and manicure implements from bone and ivory. Carlton's son Hamilton took over the business in 1893. He was the chief executive until 1954. Grandson Hamilton Jr. and Wells incorporated it in 1960. In 1993 C. J. Bates and son became part of Coats and Clark. Susan Bates Shuttle Circa 1945 manufacturing information " C.J. Bates & Son, Chester, C.T. 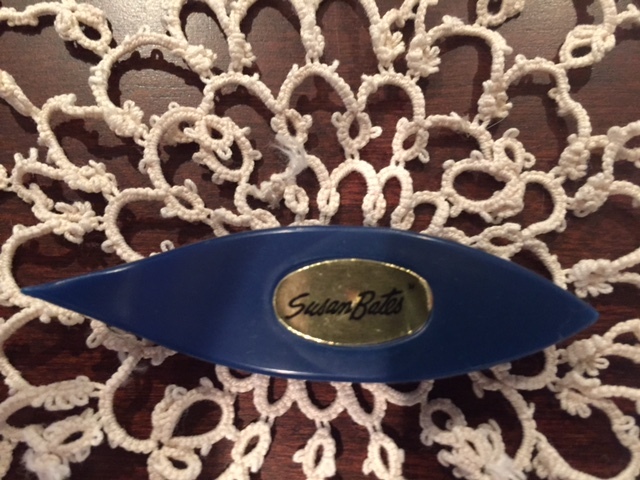 Made in USA across top " Susan Bates"
Here is another example of a Susan Bates Tatting Shuttle made later. I learned to tat with a shuttle like this, I wanted to document the changes over the years. This shuttle is smooth without the three holes and the hook. C.J. 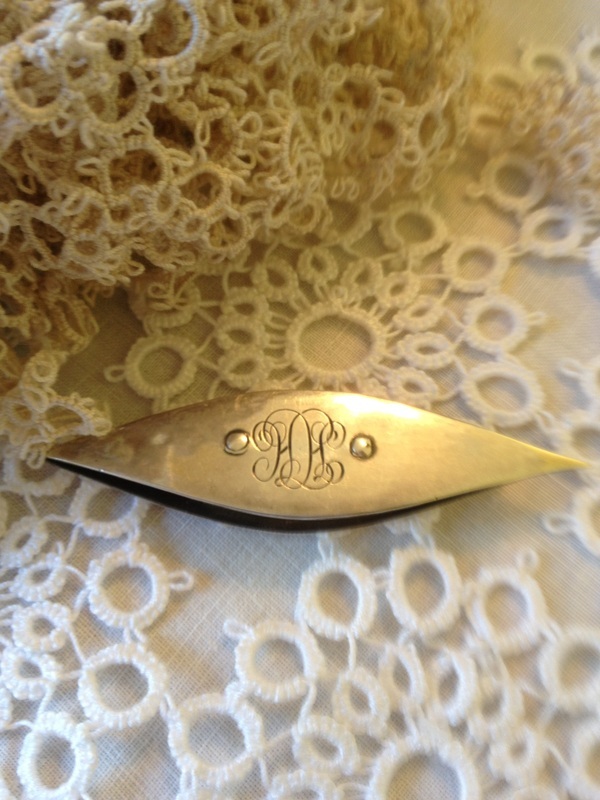 Bates offer this bone tatting shuttle with a simple but neat spray design. You can tell it's age by the rivets that it is early. C.J Bates Company began in 1873. 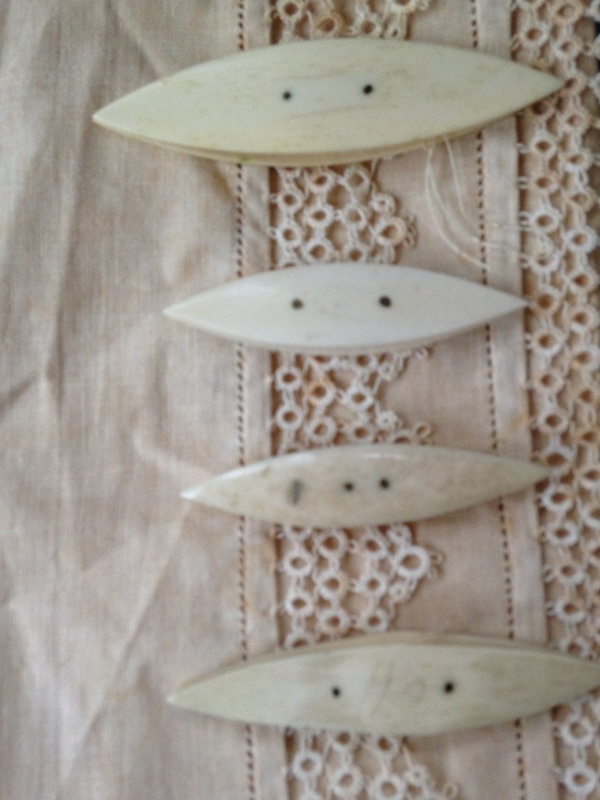 Bone Tatting Shuttles I purchased while on vacation in Albuquerque, New Mexico in August 2014. These shuttles were part of Jane's collection. Updated Pohlson Gift hand painted Swallow Shuttle- Scroll to bottom of page to see the update on that history. I wish it was, but this is not in my collection. It recently sold on e-bay. I wanted to document the history of the winder and shuttle. Scroll down to the bottom of this page for the history. Harry Samuels application was filed on June 16, 1915 and Patented October 10, 1916. Harry Samuels was from Des Moines, Iowa. This has been referenced as Tatting type Sub Class 87/52 as tensioning ring. 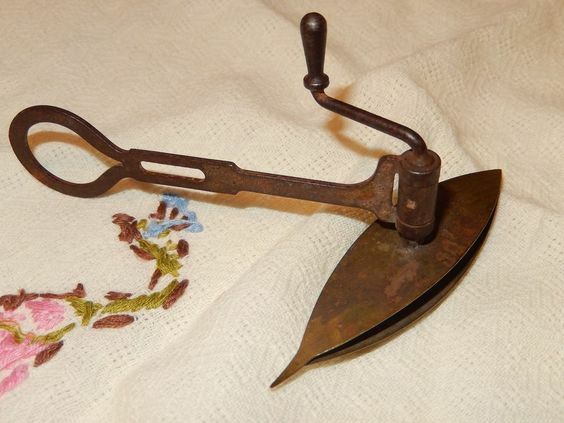 The inventor of this tatting shuttle was Constantine Hinger of New Brunswick, NJ in April 1871. 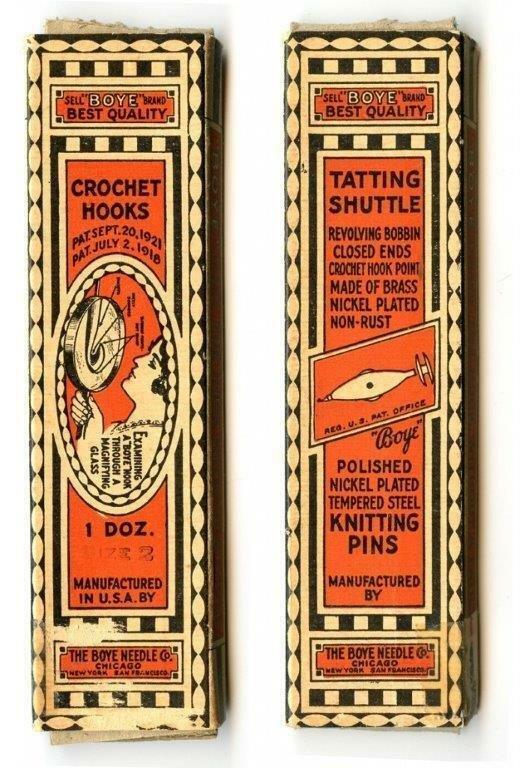 This shuttle was a combination of tatting shuttle and a crocbeting needle. 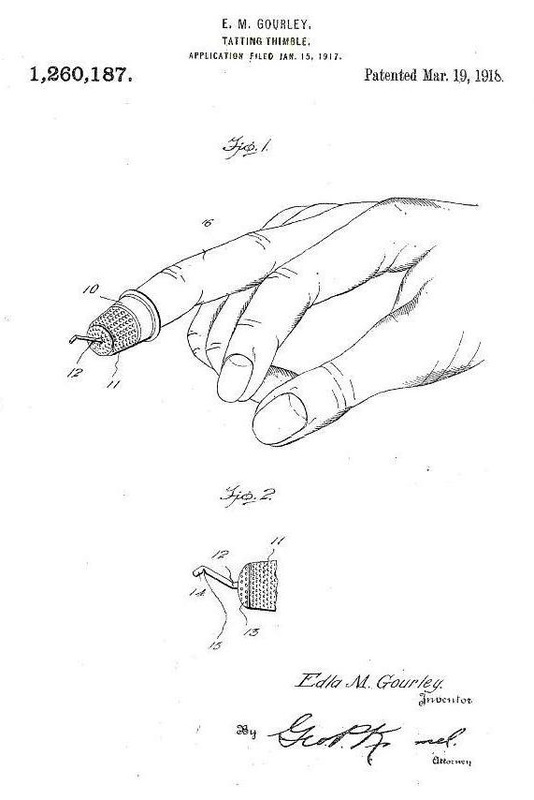 Patent : US5727439 filed Sept 11, 1995 by Lauren P. Pelc Publication date March 17th 1998 this shuttle has two removable bobbins. This shuttle was purchased because of it's unique color. I have had several dealers look at it and told me it was from 1920's to 1930 era. I don't know the maker of this shuttle. I was told by Carol "Boo" Moncrief Steed that it's a German made shuttle, from quite a while ago. Several others have also commented that it is German made. I have contacted the owner for more information, hope to give update very soon. I would like to say "Thank You" to Boo for her patience and kindness as I was learning to tat. Like me, she also had a very "special grandmother" that came to our tatting club. Her Grandmother could tat circles around everyone in the room. I can still see her today in her sun bonnet tatting away. This was part of Jane's collection. 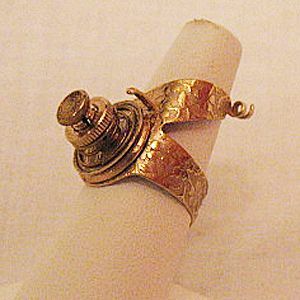 This was listed as " Rare Vintage Sewing Bobbin Ring" It was produced by the Crane Product Inc with copy right mark hallmarked on bottom of ring, this item was sold for $124.According to the seller it is etched in a beautiful floral pattern and made of brass. 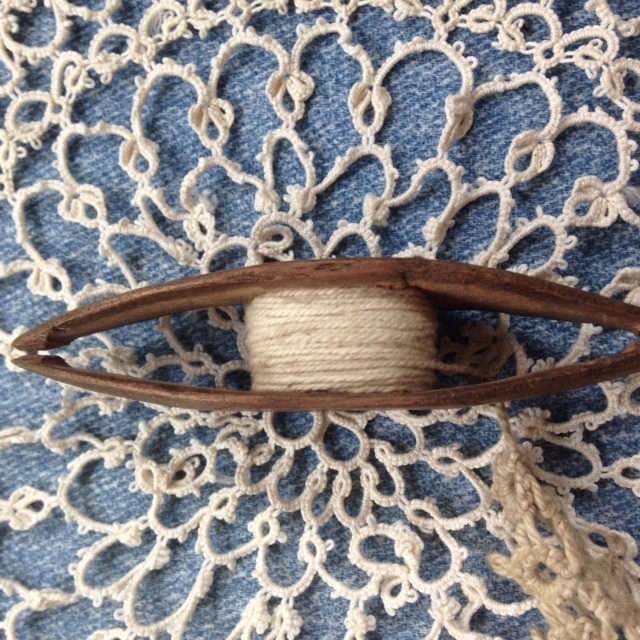 The top part spins and will holds your bobbin. 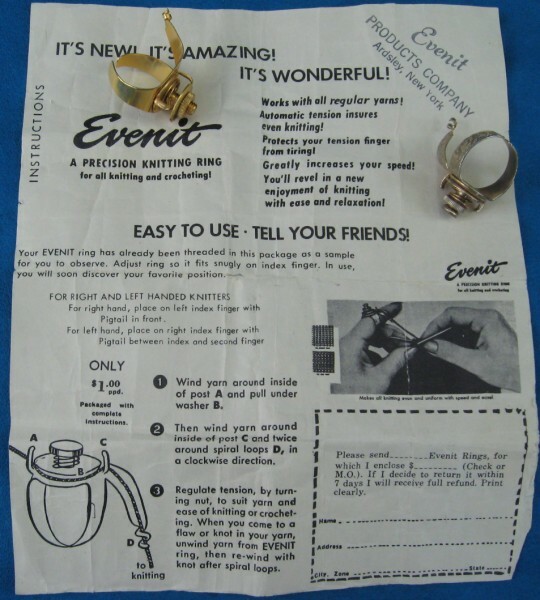 The picture below shows a ring made by "Evenit" from Ardsley, New York and sold for $1.00. 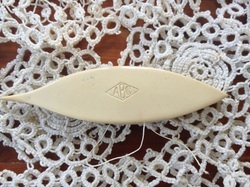 It was used for knitting and crocheting. 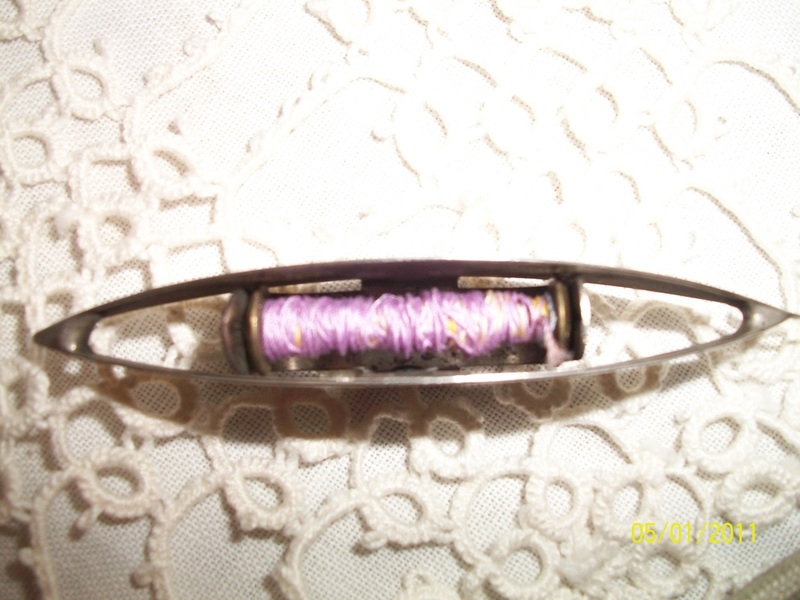 It shows how to wind the thread thru the ring. The inventor of this shuttle was James H. Boye of Chicago. He filed for patent of this shuttle November 10, 1915 and patent was published April 10, 1917. This shuttle has the bobbin slide out arm. Scroll down to see picture of this shuttle. In memory of my grandmother "Susie Landrum" this shuttle was made by Georgia Sietz in July 2000. 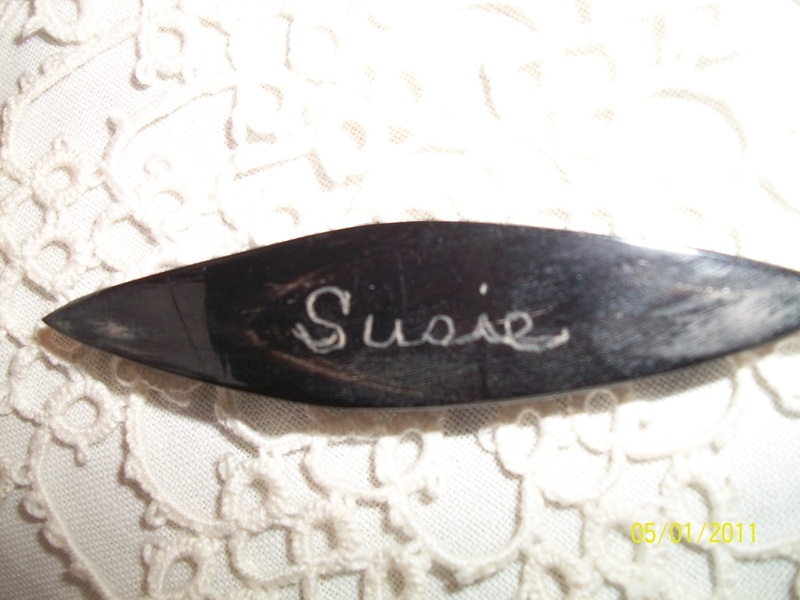 I purchased a second one with my mother's name and grandmothers name as a special gift to my Mother. Updated 7-14-15 " Mystery Shuttle"
A first glance I thought this shuttle was made by the "Webster" company from around the l869 to 1950's. However, I was mistaken the word "sterling" is on the outside and on the inner post of this shuttle. 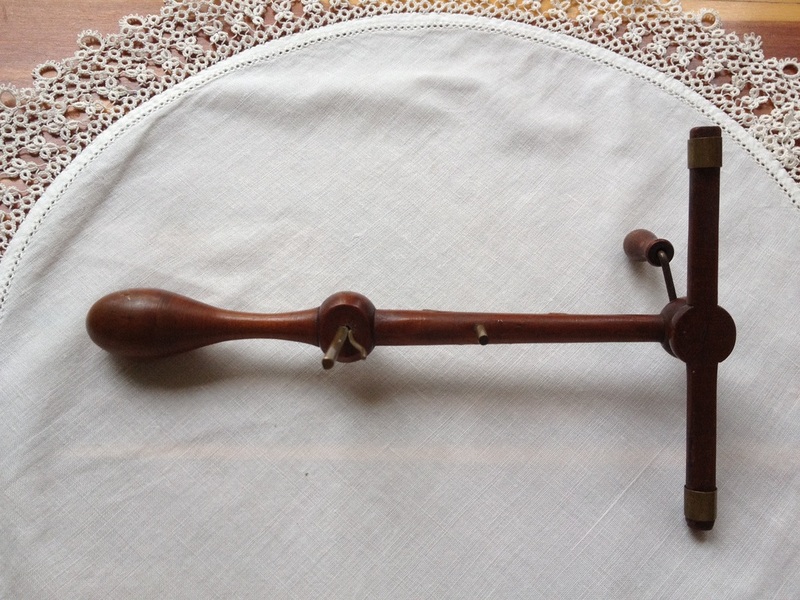 It doesn't have any other markings such as "Nussbaum and Hunold". The center of this shuttle is more of diamond shape then oval shuttle. 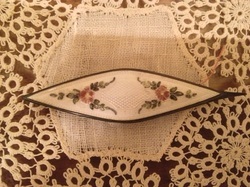 It's different than my sterling "Webster" shuttles even though it has the same floral design. 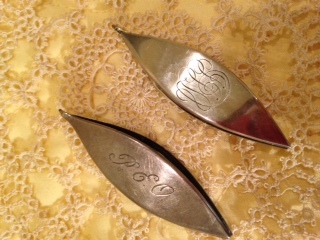 "Webster" sterling tatting shuttles have a stamp design that is a "W" with a arrow through it to mark their shuttles. 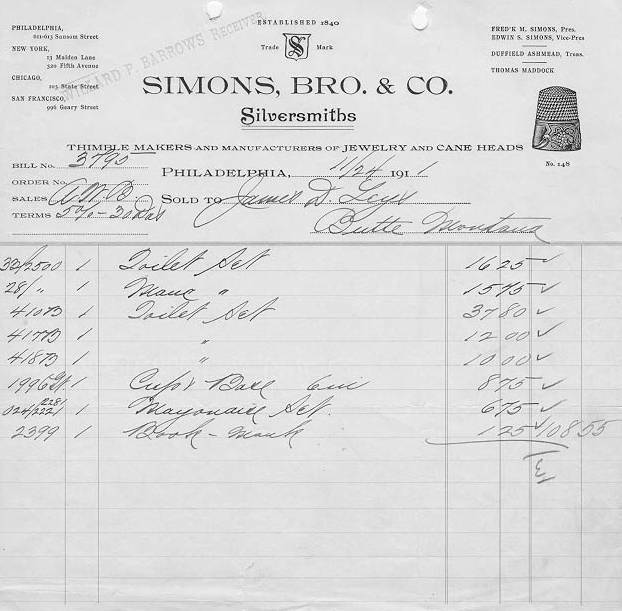 Thanks to " Online Encyclopedia of silver marks and hallmarks, I have learned that Nussbaum & Hunold was located in Providence, Rhode Island Circa 1920. I since found that a shuttle like this was sold, in online auction as Nussbaum & Hunold on May 28, 2010.This shuttle has sterling mark on out of shuttle and inside of shuttle. 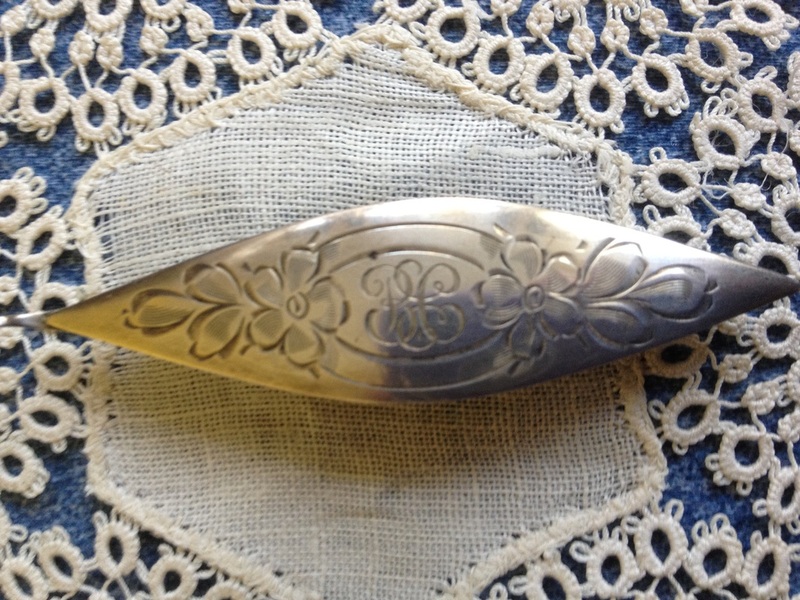 This is my Foster & Bailey sterling shuttle from around 1878. This shuttle has F & B stamp to help you locate the maker. It is not in the best condition, however for it's age I love it. Foster & Bailey shuttles are heavier than the normal shuttles. They were in business from 1878-1898 in Providence, Rhode Island. 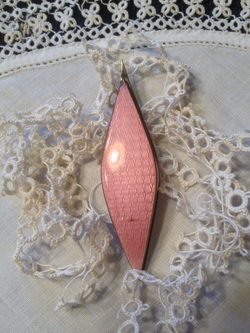 Many of their items can be found today in brooches and lockets. This is my Foster & Bailey with a simple bordered edge. German Silver Shuttle "P.P.I.E 1915 San Francisco." This shuttle was sold as souvenirs at San-Francisco Worlds Fair. The Pan Pacific International Exposition ran from February 20 until December 4, 1915. The fair was in celebration of the Panama Canal and Commemorated the 400th anniversary of the explorer Balboa's discovery of the Pacific Ocean. This shuttle was a great memory for someone 100 years ago this year! This shuttle was a Christmas present from my in-laws Lewis & Darleen. This shuttle came out of the Estate of Sallie Birdie, the former Mayor of Carmine, Texas. I found out how the locals pronounce it is "Carmeen". 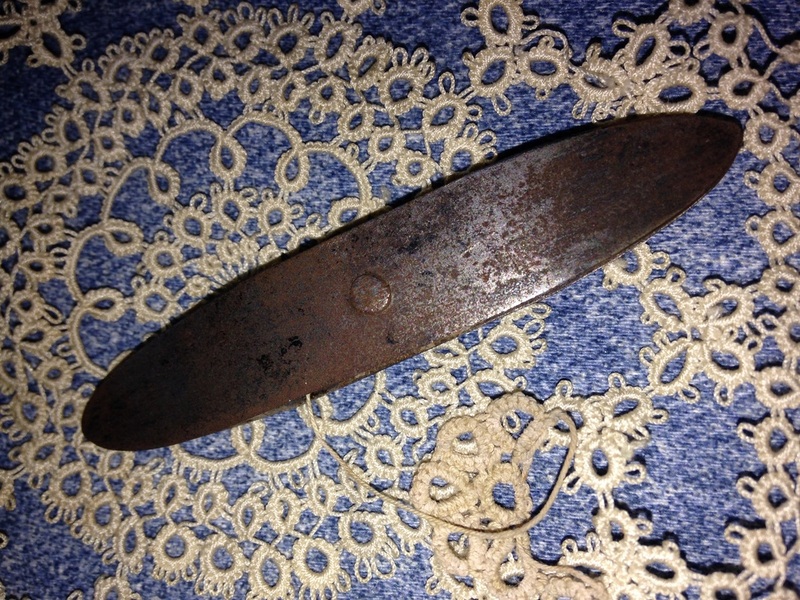 I don't know how she came by it, however it appears handmade and very old possibly blacksmith made. I was told she was a pistol packing Mayor, quite the character. This company made shuttles in 1920's. 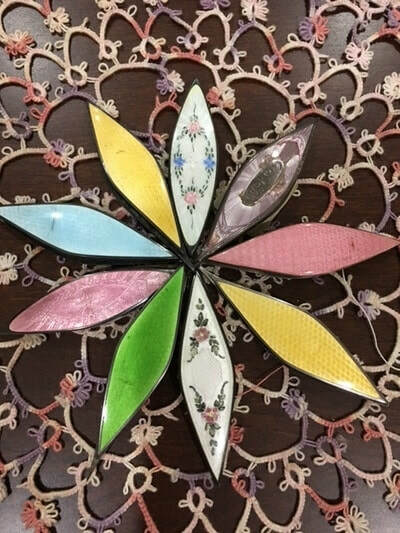 The company produced stamped designs and enameled. Here are various examples of N&H shuttles. Nussbaum & Hunold "N&H shuttles" were from Providence , RI. 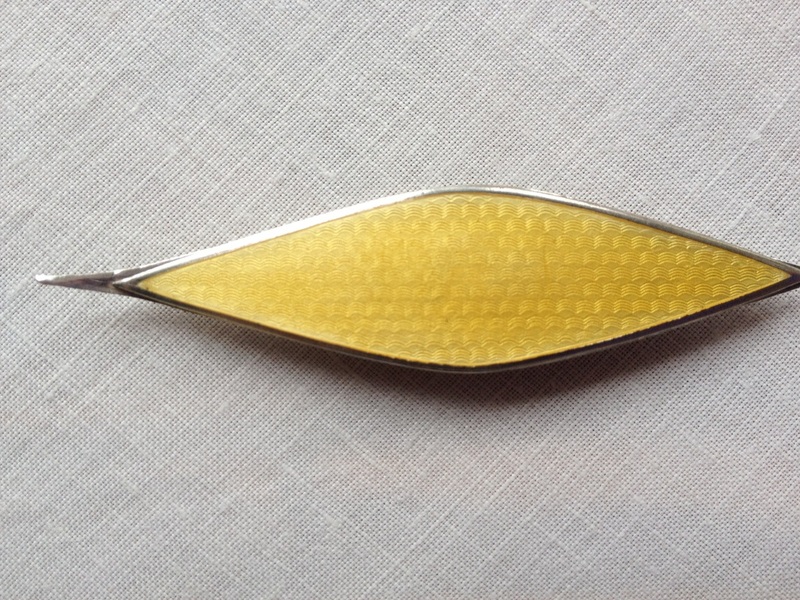 Walter Hunold had a short lived partnership with Nussbaum, Walter was a jewelry maker. 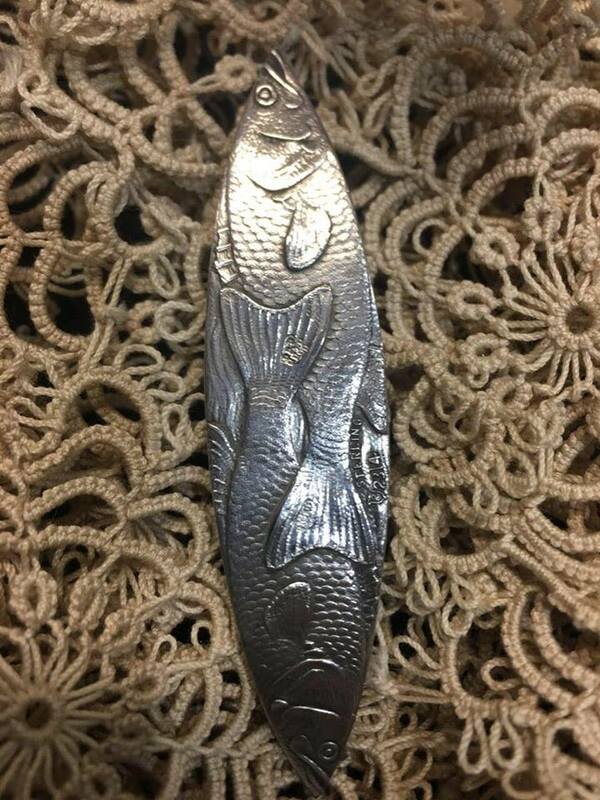 I found this information while searching sterling silver marks. 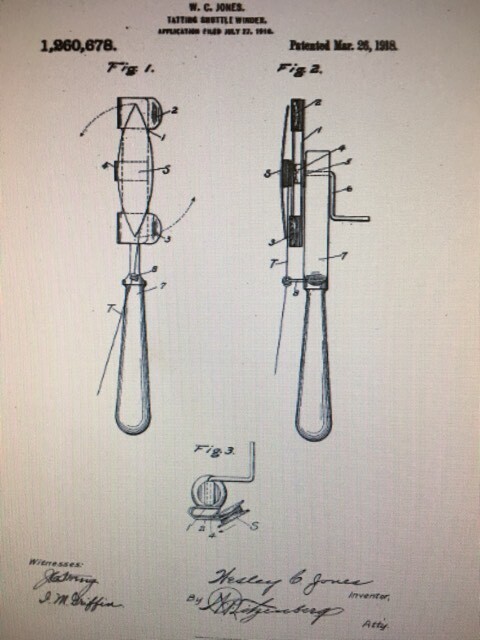 In 1924 Charles D. Fischer was granted a US patent for a shuttle and winder. This shuttle is referred to as " Keyhole", the name refers to the keyhole shape slot in the middle of the shuttle where the winder fits. This complete set belonged to Jane H. Clarke who started her collection at the age of 12. You can usually find the shuttle, but not the winder. Wow! I am honored to have the complete set in my collection. I purchased the C.D. 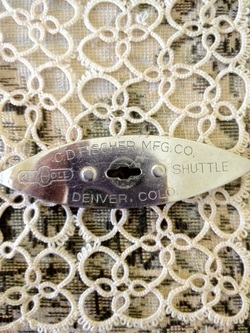 Key Hole Shuttle from Bonnie Demmer's Collection in July of 2012. This shuttle was shown on page 53 of "Tatting Shuttles of American Collectors" by Heidi Nakayama. I am honored to have a shuttle out of her collection. She did not have the winder in her collection at that time. This C.D. Fischer Winder and shuttle sold for $1.75 together, extra shuttles sold for .50 cents around 1926 according to Needlecraft advertisement. 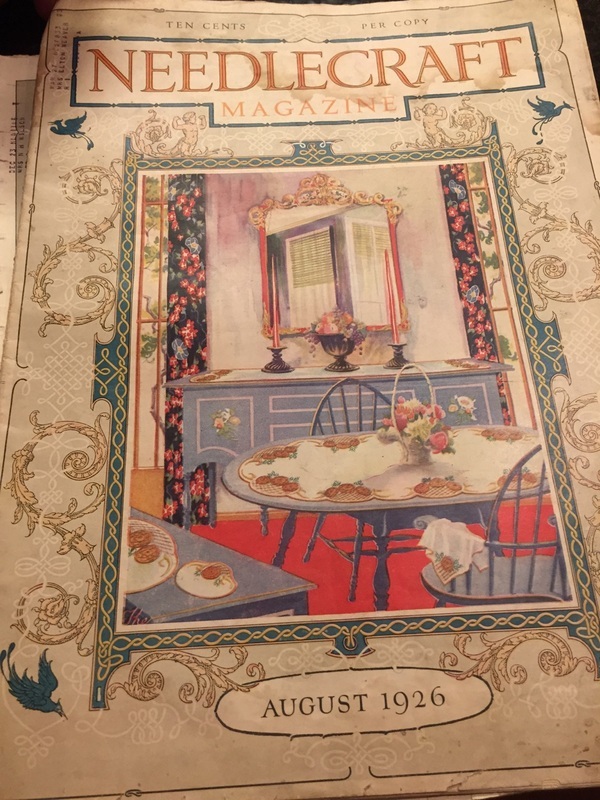 This is the add in the Needlecraft Magazine from 1926. Updated 8-5-14 1915 Bob- O- Link Shuttles " HEART DESIGN"
This shuttle belonged to Jane H. Clarke who started collecting shuttles at the age of 12. 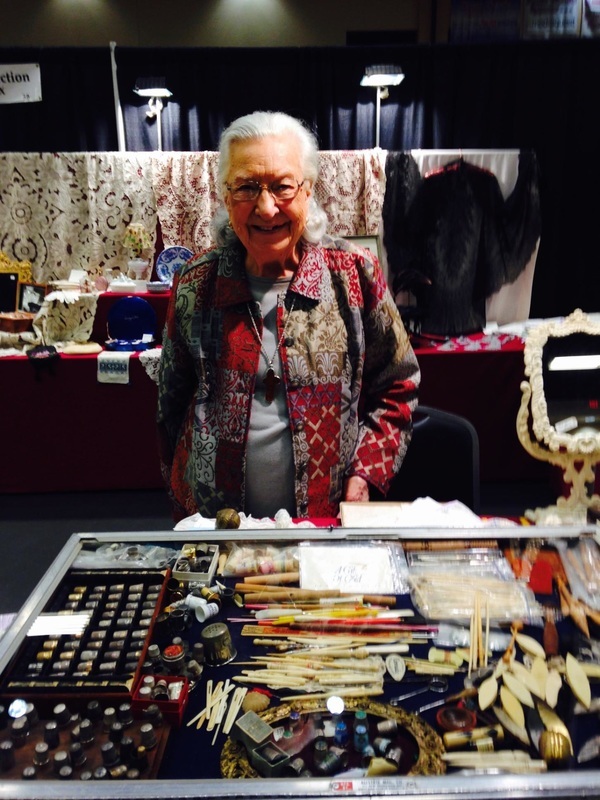 She is the owner of Morning Glory Antiques and Jewelry in Albuquerque, New Mexico. If you're ever in Albuquerque, I strongly suggest you stop by. Her passion is jewelry, but the shuttle was purchased on Valentine's Day not knowing until later of the heart design on the inside. Bob-0-Link shuttles were patented by G.A. Donaldson, but manufactured and sold by the Eisenstadt Mfg. Co. of St. Louis Missouri. 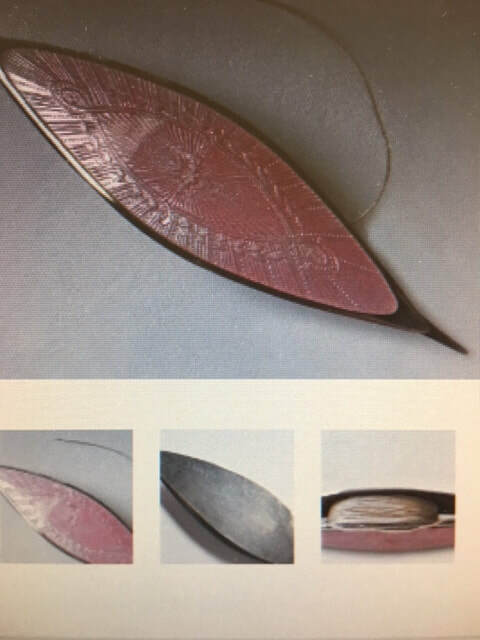 This company also made jewelry. 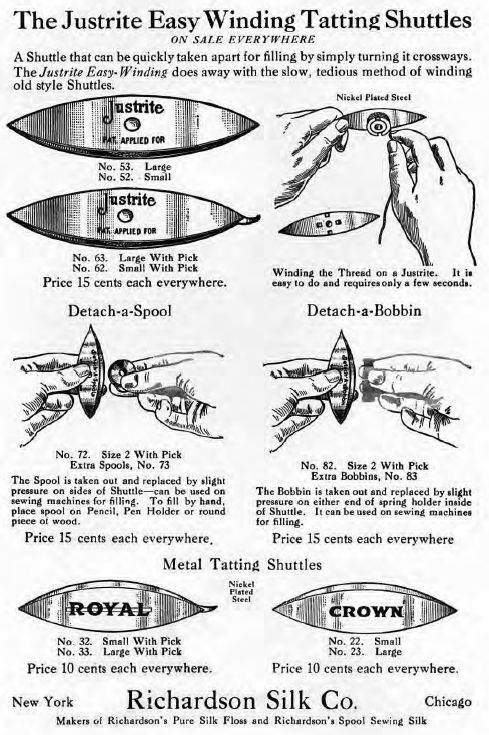 Needle Craft Magazine dated November 1915 shows the add for Bob-0- Link shuttles. (Scroll to bottom to see ad previously posted.) 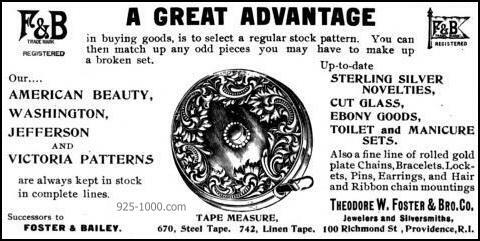 The ad states sterling silver sold for $1 to $3, solid gold for $10 to $20 and nickel plated .25 cents in 1915. This shuttle and others found a home in my collection. Jane no longer collects tatting shuttles. The top picture shows two shuttles that are Bob-0-Link shuttles in my collection. Carlton Bates bought the business from Mr. Post in 1873. 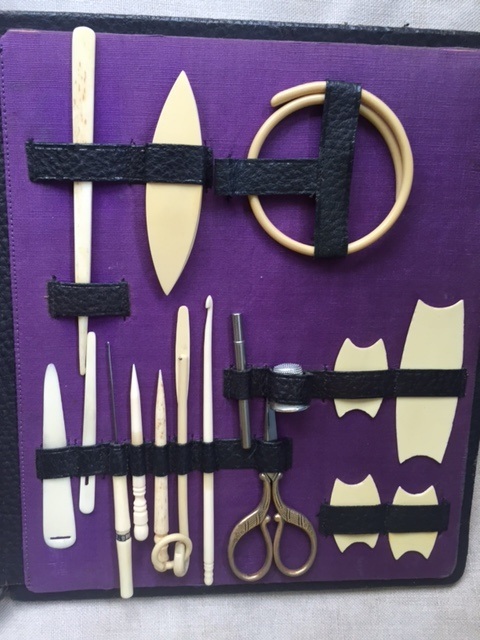 He continued to make small items such as crochet hooks, studs, bodkins and manicure implements from bone and ivory. Carlton's Son Hamilton took over the business in 1893. He was the chief executive until 1954. Grandsons Hamilton Jr. and Wells assumed leadership of and incorporated it in 1960. In 1993 C. J. Bates and son became part of Coats and Clark. C.J. 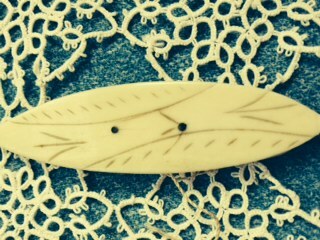 Bates bone shuttles carved wtih leaves shape lines were a give away item for the advertisement. 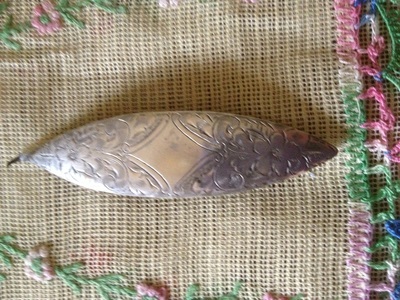 Pumpkin seed shuttle from 1920's - I have one in black and ivory and blue. This shuttle and box was purchased while in Maine. 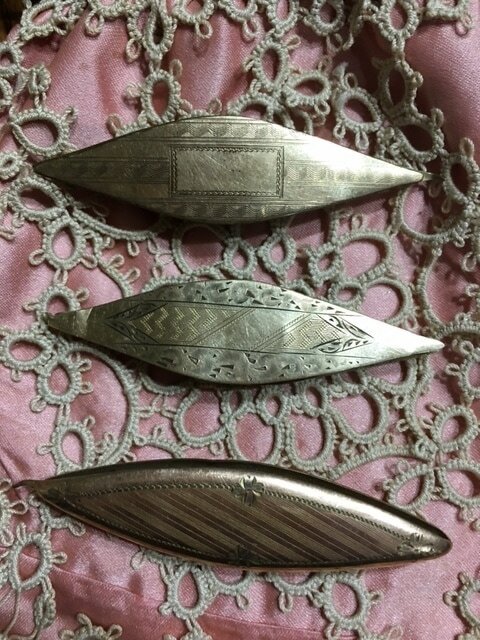 It came out of wicker sewing basket that was very old, I purchased 3 shuttles from 1917-1920's era. She specialized in wicker sewing baskets and carriage buggies. Purchased large box of shuttles. It happened to have the blue and pink pumpkin seed shuttles in the box. This shuttle was made blue, pink, ivory and black. This shuttle was gift from my mother many years ago. I thought I would display it to show some of my" Contemporary shuttles." It came from Lacis in Berkeley, California and it's made from "Dymondwood." While my passion is vintage shuttles, I will try to show more contemporary shuttles. Plastic shuttle made by "Gloria". Gloria appears in cursive with the word "Trademark", I purchased this shuttle for the unique color. Gloria shuttles in black, french ivory or tortoiseshell are usually easy to find. This shuttle came from an estate sale in Forth Worth, Texas. This shuttle was purchased in Kennebunk Maine. 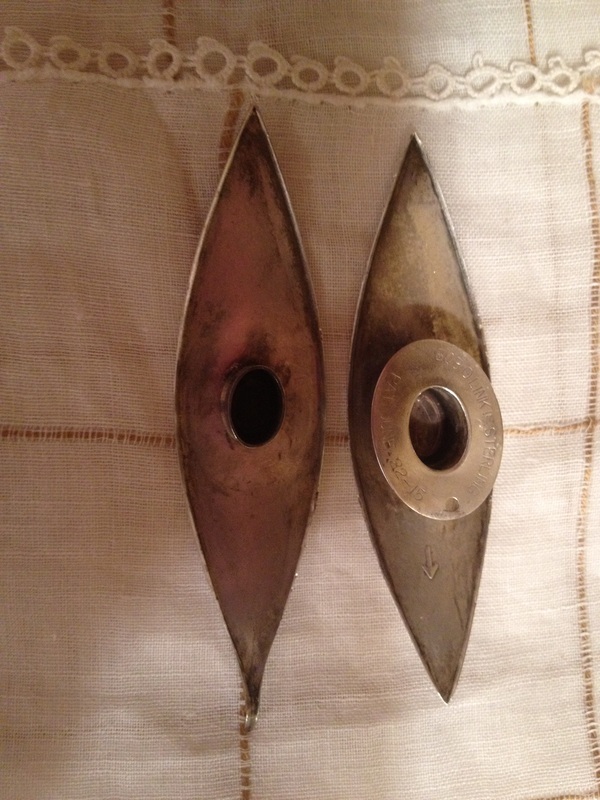 I was told that it came out of estate in Kennebunk, Maine and is from 1930's era appears to be tortoiseshell. 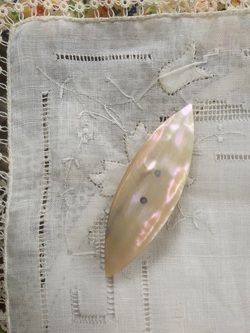 This shuttle appears to be Abalone not Mother of Pearl. 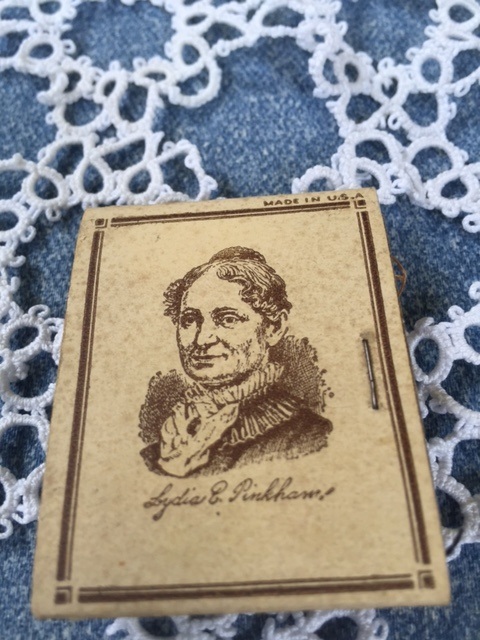 I purchased it in Wiscasset, Maine at Showcase Antiques. Ideal location on Route One in the heart of mid-coast antiques route. I was disappointed that the owner could not share any history on this shuttle. I'm almost certain this sterling shuttle is marked "N&H". If so, it is a Nussbaum & Hunold from 1920. 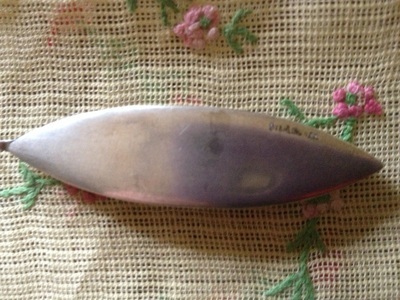 My husband purchased this sterling shuttle for me at a great price. I was told that it came from the New England area. 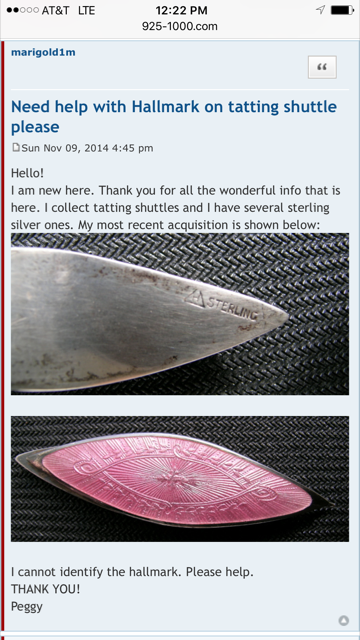 If you know more about the maker of this shuttle, please e-mail me at tattingcollector@yahoo.com with any information. This shuttle was purchased 2-26-12. This lovely bone shuttle was a Christmas gift from my Son and Daughter-In-Law. They purchased it while living in Marseille, France. I was thrilled that they found a shuttle in their city and brought it to Texas! I keep this on display in my special shuttle display cabinet that Mike bought me. Does anyone know anything about a shuttle company with the stamp BLAIR? I know nothing about this shuttle, would love to know any information on the marker and age of this shuttle or person it belong to? 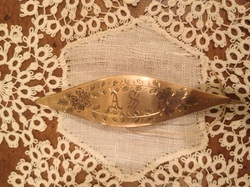 "Annie A Lemberger" is engraved on it, does anyone know anything about that name? Codding and Bros. & Heilborn was in business from 1879-1918. 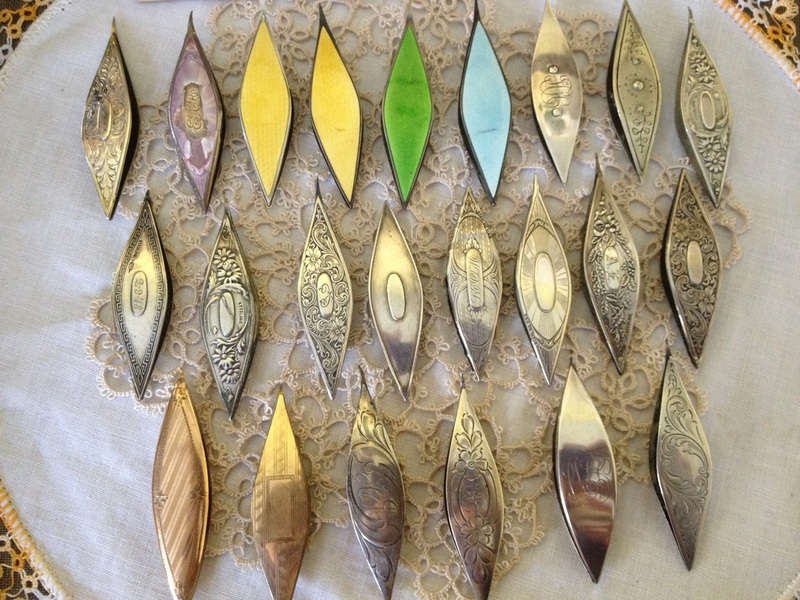 They made a variety of stamped and hand engraved and enamel shuttles. 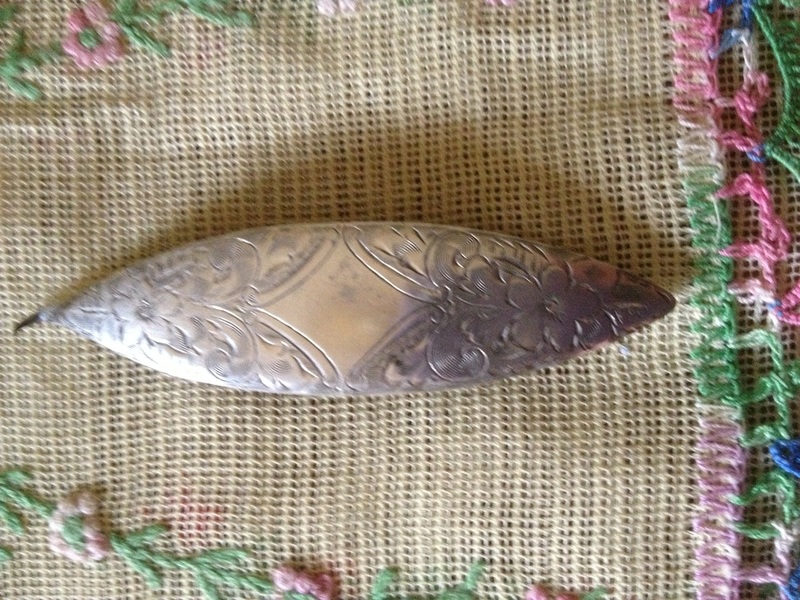 This sterling silver shuttle was purchased from a Church auction. It is only fitting that 100 years later it would find a home in my collection. I am sure that this shuttle was special to the person it belonged to. It's one of my favorite shuttles in my collection. 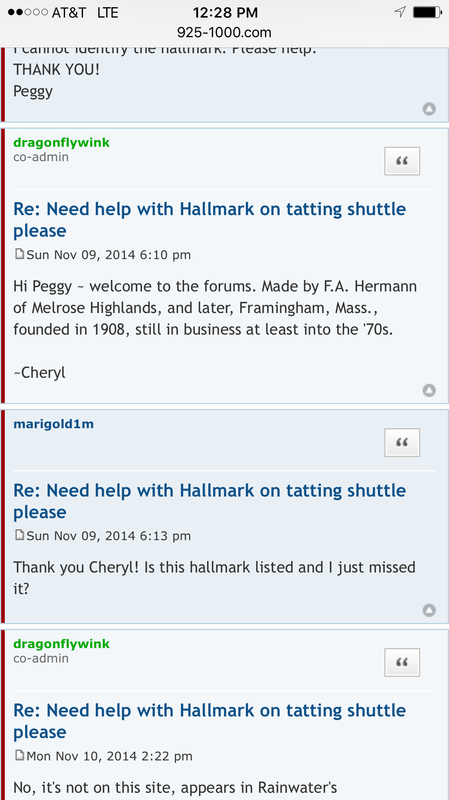 C. B & H shuttles seem to be harder to find than Webster shuttles. 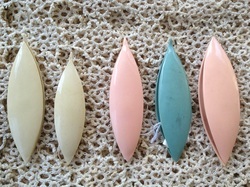 Some of my favorite tatting shuttles. 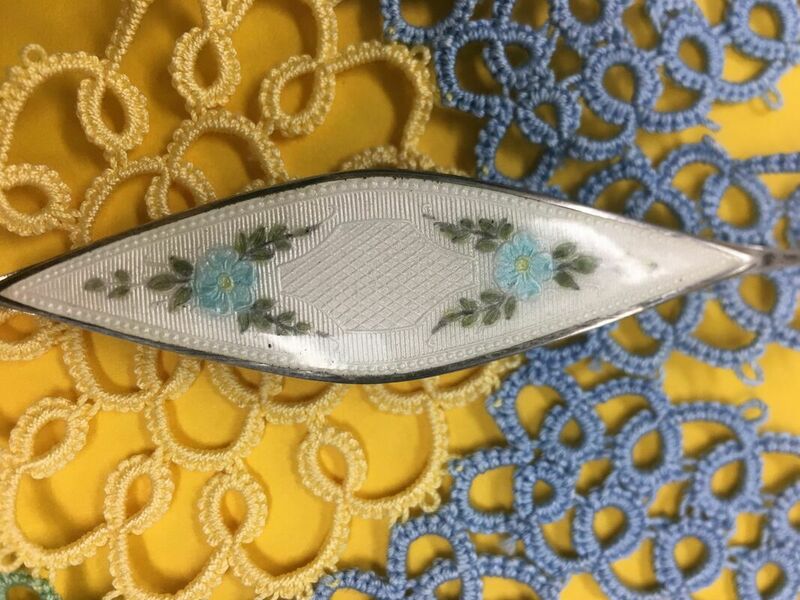 Sterling Guilloche enamel shuttle made by Webster in the 1800's, they made a variety of floral design shuttles. This shuttle also came in blue and lavendar flowers. 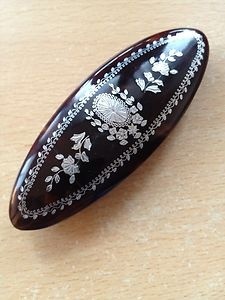 While shopping with a friend, I stumbled across this "Guilloche Enamel" thimble marked Sterling Germany 6, I fell in love with it. Even though I do not collect thimbles, it was calling my name. The shop owner told me she purchased a large thimble collection from an estate. Guilloche is a French word and means Engine turning. 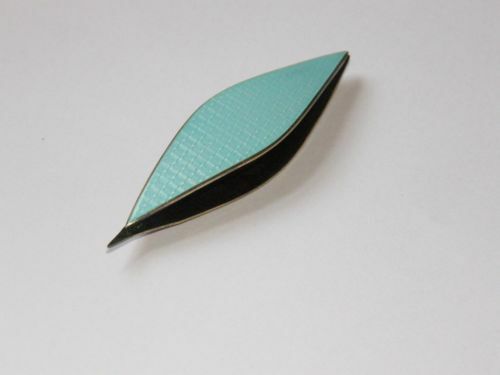 The enameling technique is done first by engraving the metal plate and then adding the enamel to create the design. This shuttle is currently on E-bay for sale. I wanted document the color to show that it was made in blue floral as well as pink! Updated 3-2-19 This shuttle found it's way in to my collection. It was a Christmas 2019 present from Mike. I was quite surprised to see it! The necklace was purchased while on a trip to Colorado with my Mike and Mother. It was purchased from a collector. you're a nurse...how did you get interested in collecting these? 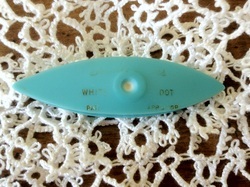 This tatting shuttle was made by The Hero Manufacturing Company of Middleboro Massachusetts. They bought the rights to produce "Detach-A- Spool and Tilco" according to Heidi Nakayama around 1948. ( see her book page 54)Tatting Shuttles of American Collectors 2002. Updated 4-14-13 Similar to Susan Bates "White Dot"
This is my second shuttle to post made by " The Asmus Bradley Company of Chicago". 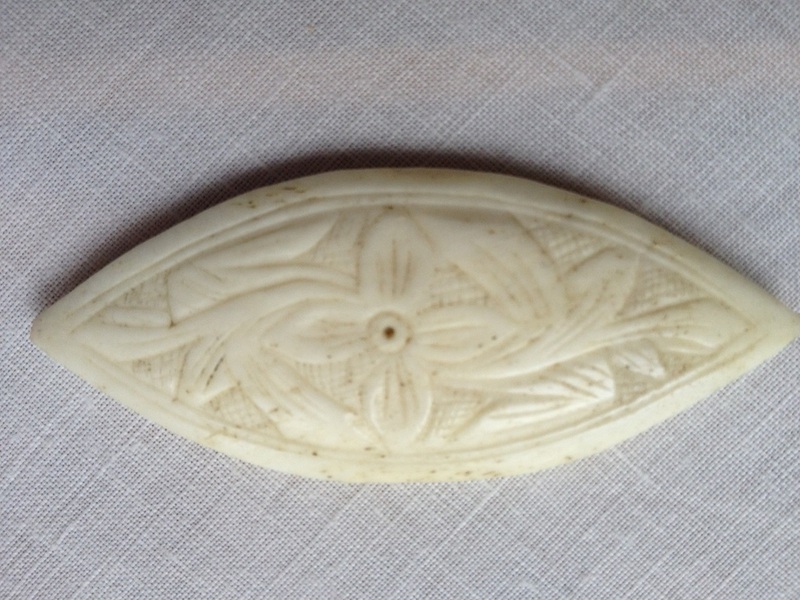 This one has a much better detail of the logo of the company and is not french ivory. I found this shuttle at an antique show. The lady sold it for $5.00. 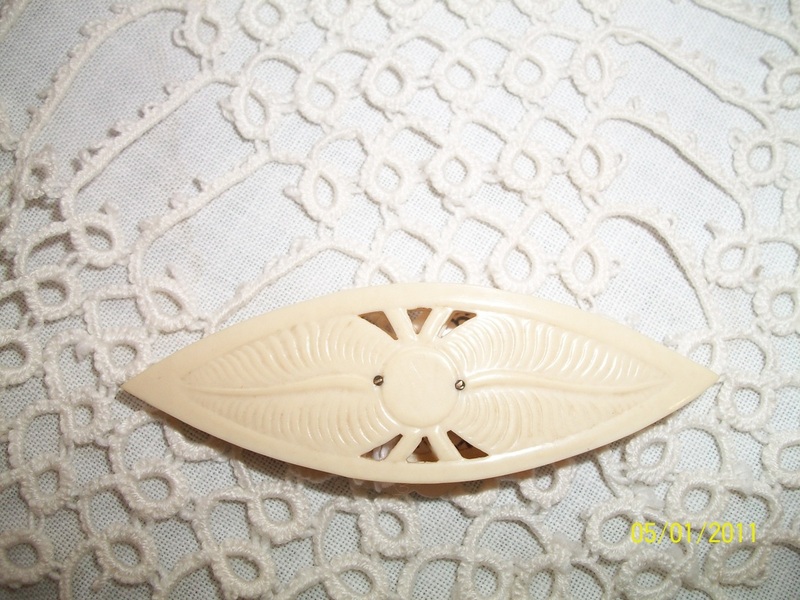 I bought it since the logo was not worn like my french ivory shuttle. If you scan down this page you will see the difference. 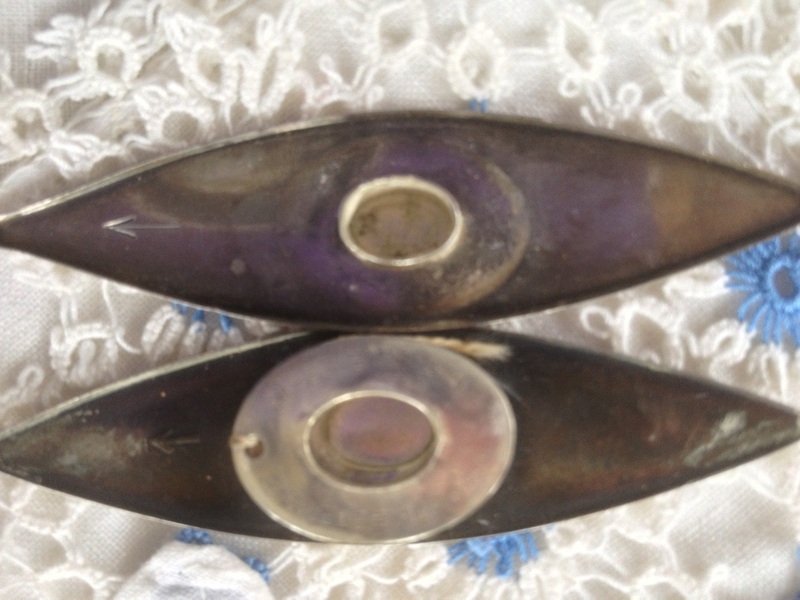 N&H manufactured shuttles and jewelry in 1920's. They produced two sizes of shuttles. 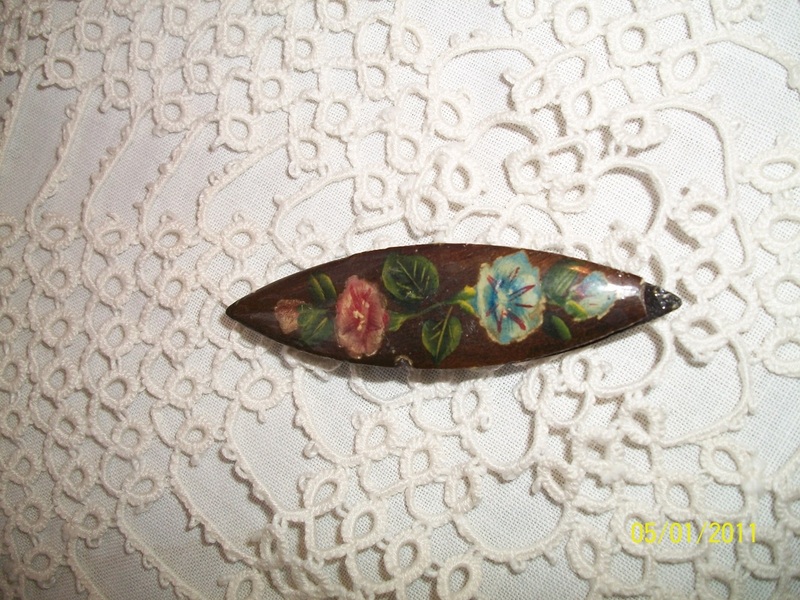 I purchased this shuttle from Rene Freeman, a collector of vintage sewing items. This shuttle is larger than my other sterling shuttles. 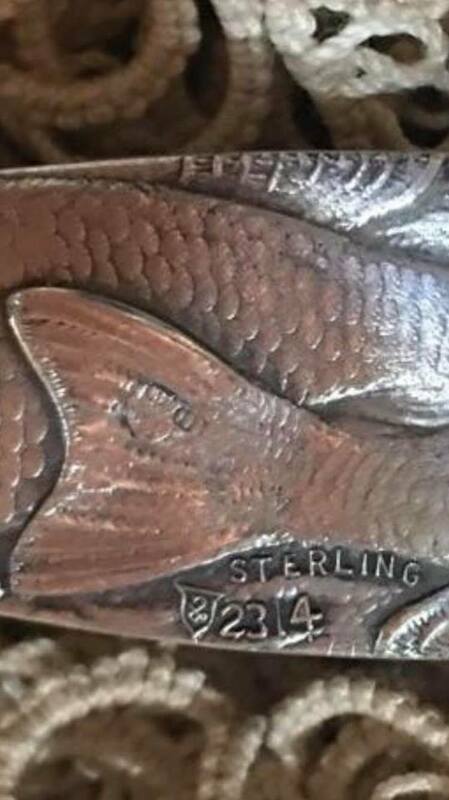 The marking of sterling and N&H is on the back side. 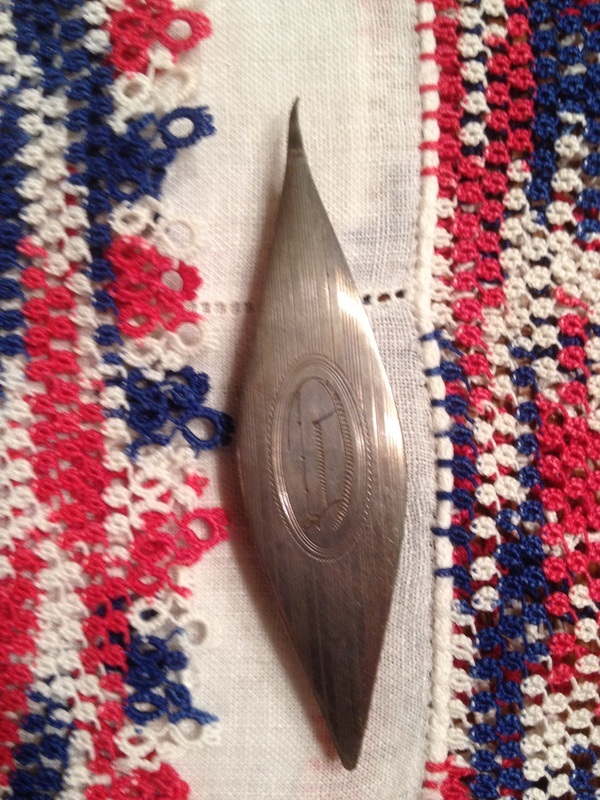 Sterling Webster shuttle of the Greek key design. 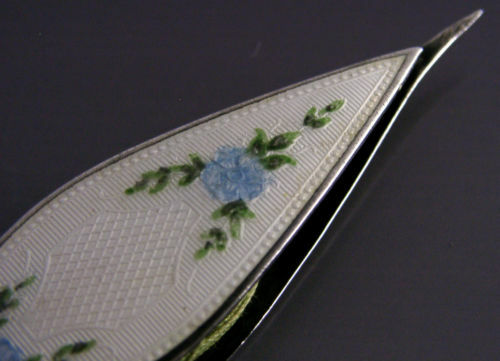 This is a beautiful enameled sterling silver shuttle. This shuttle was a Christmas present from my wonderful husband. This shuttle has a marking on the inner side it is not a Webster. This shuttle has very distinctive hand engraved symbols on inside and the word sterling 1352 after the symbols. 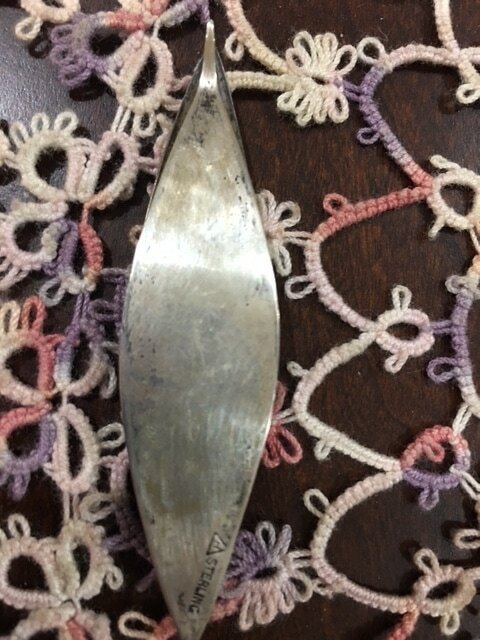 I believe it was made by Thomae Co. of Attleboro Massachusetts. This shuttle has a unique marking see below: It has a crown, the letter T, lion stamped on the inside of the shuttle. 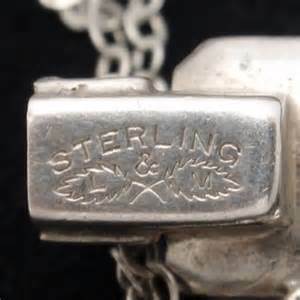 It also has the word sterling 1352 after the symbols. 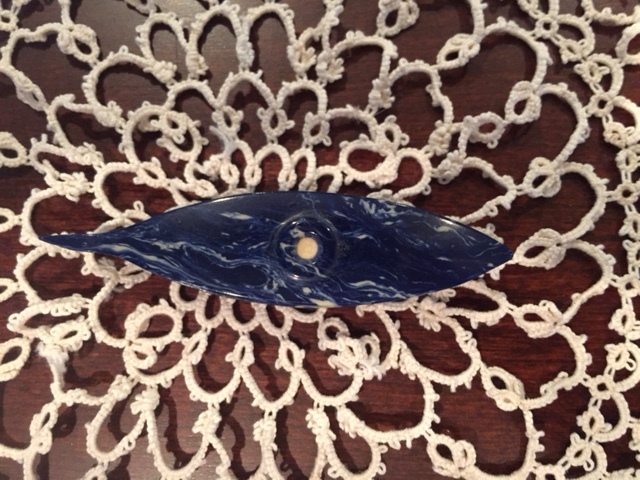 Here is a another example of a blue shuttle made by the "Charles Thomae Company" of Attleboro Massachusetts, but it's not in my collection. If you look closely at the picture you can see the very unique design that his shuttles are known for. I love to document the different colors the company made. This was a Christmas gift from my Mother. I do not know who made the shuttles. They were purchased from England. 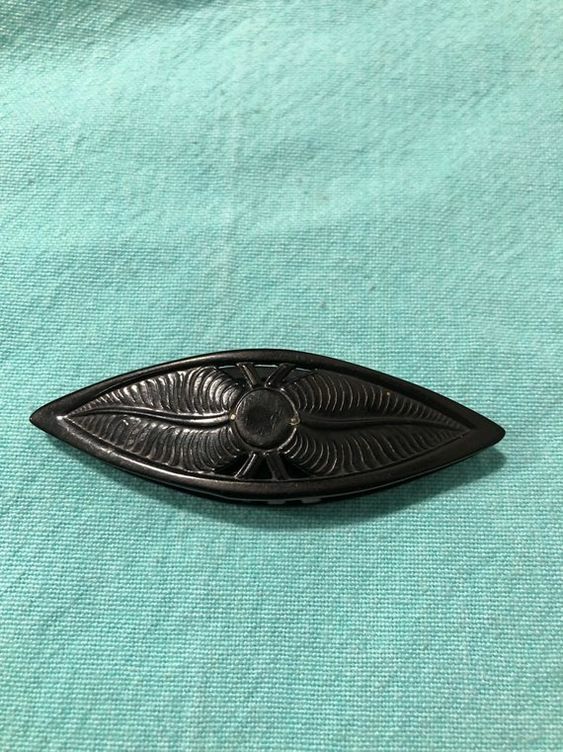 If you know anything about the maker please e-mail me. Italy. You can purchase the plastic shuttles from www.tombolodisegni.it, click on "SHOP", then "CHIACCHIERINO", then look for ART.NAV22 "navetta economica" 1 euro – send an email request to order." 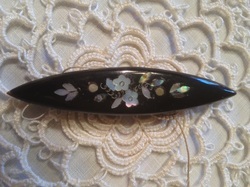 Here is a wonderful Mother of Pearl tatting Shuttle. I do not have any information on this shuttle. This shuttle is pure white. 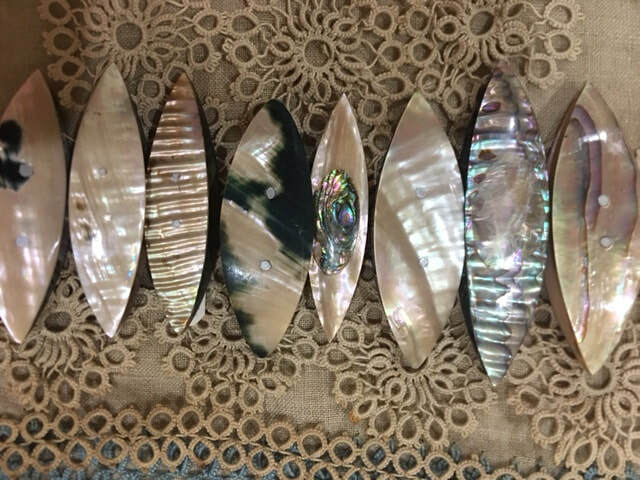 reports that Abalone has a distinctive wavy pattern. Here is a wonderful shuttle made by Eisenstadt Mfg Co of St. Louis Missouri. 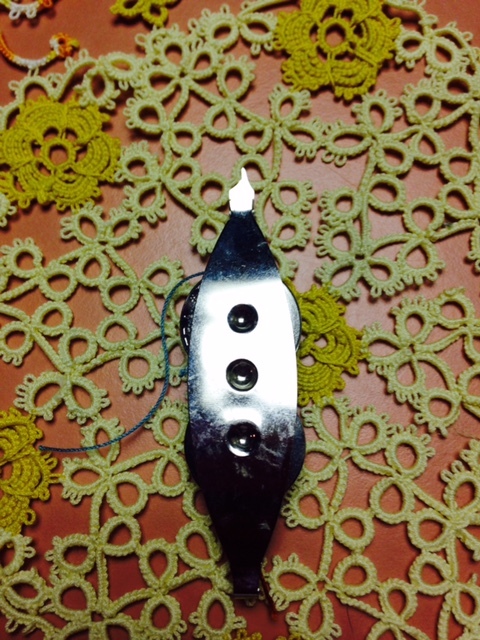 It is a sterling silver Bob-O-Link tatting shuttle. Inside states PAT JUNE 22-15. This is my second Bob-0-Link shuttle. The owner of this tatting shuttle did not know that it pulled apart and was quiet surprised to see that it came apart. 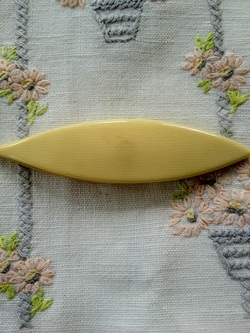 Celluloid shuttle with with indented slits in either side to form inner post. 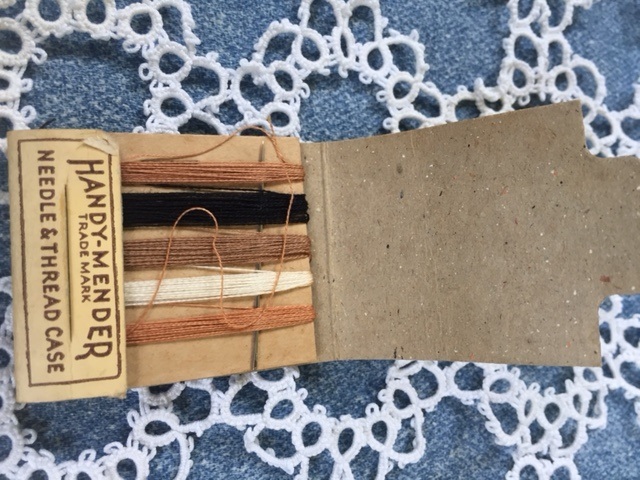 I found the thread winder not sure about it's history. I found this BABY BLUE BOYE Shuttle, the color is not listed in Heidi Nakayama book. 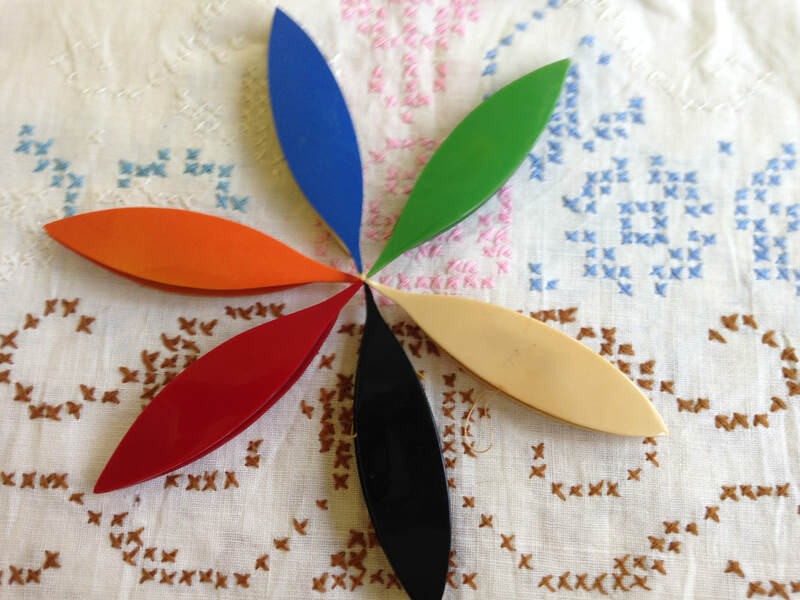 She talks about red, yellow, green and white. Please see my Boye collection below. I bought it because of the color. 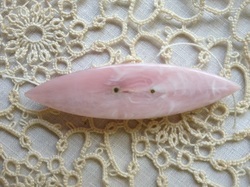 Updated 9-3-12 Hand Blown Glass Shuttle " Contemporary "
Here is a one of a kind shuttle. It is not a vintage shuttle, but I fell in love with it. 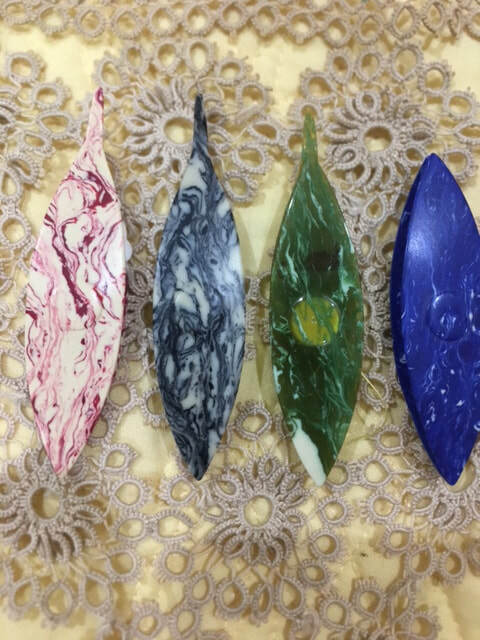 It is a hand blown glass shuttle made especially for my collection. I am proud to display it as no one can reproduce a one of kind shuttle. This shuttle was gift to me from my Mother. The shuttle markings are faint, but it's "ABCo". The "ABCo" diamond is in the center on one side of the shuttle. 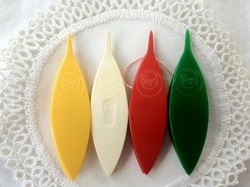 Boye tatting shuttles in all the colors. The red shuttle is very special as it belonged to my grandmother. It still has the pink thread on it from when she was tatting stuff for my wedding. This shuttle was given out as advertising in the 1920's to promote the Carnation Evaporated Milk Company. 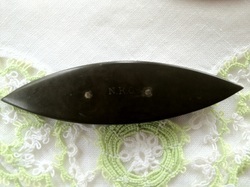 Rubber Shuttle made by Novelty Rubber Company whose initials N.R. 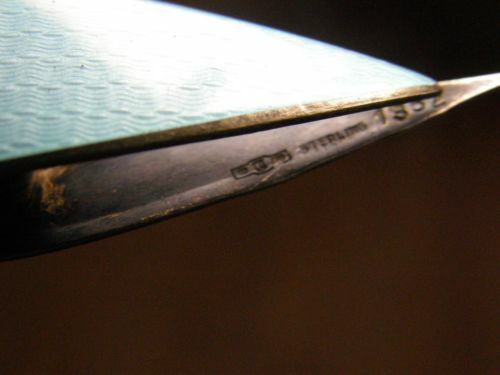 Co., can be found stamped between the rivets of the first rubber shuttle produced in America. According to Heidi Nakayama book Tatting Shuttles of American Collectors on page 55 refers to this shuttle. 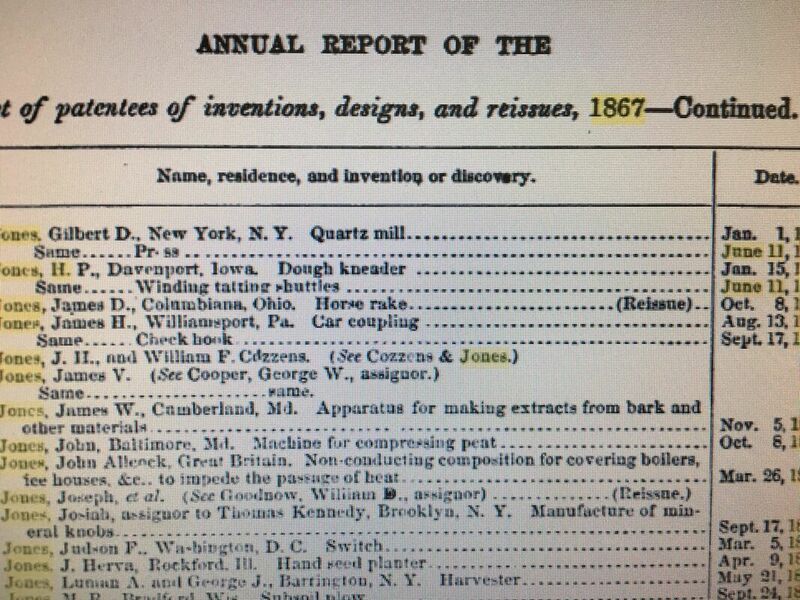 This company was started in 1851 in New York City. This is a Gloria shuttle. 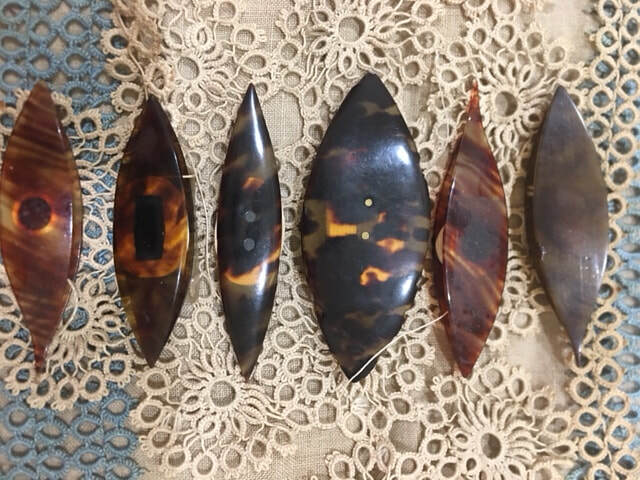 It is tortoiseshell. 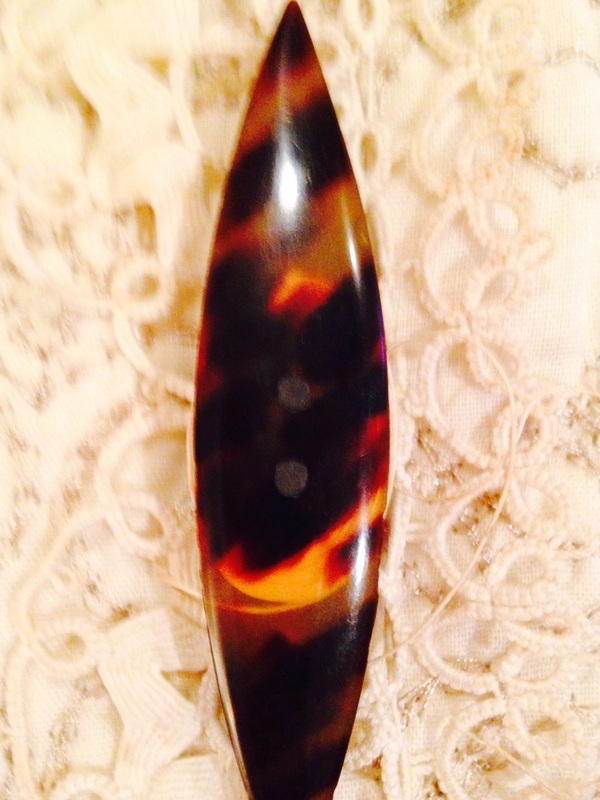 It was made in black and french ivory as well as tortoisehell. Susan Bates White Dot shuttle. 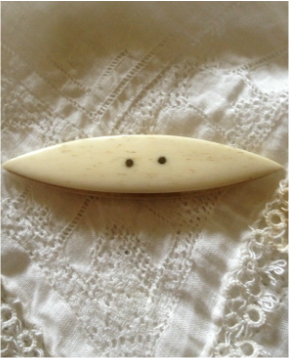 It has a white dot on either side and "Pat. App'd for" on the bottom. This shuttle was made in the 1930's. This shuttle was made in black, red, white, blue and green. 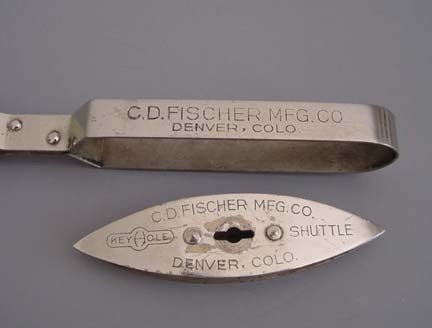 Charles D. Fischer keyhole shuttle 1924. This shuttle is unique it belonged to Bobbie Demmer. You can read about it on pages 53 & 98 of Tatting Shuttle of American Collectors by Heidi Nakayama. I am honored to own something from her collection. I am looking for a winder that goes with it. 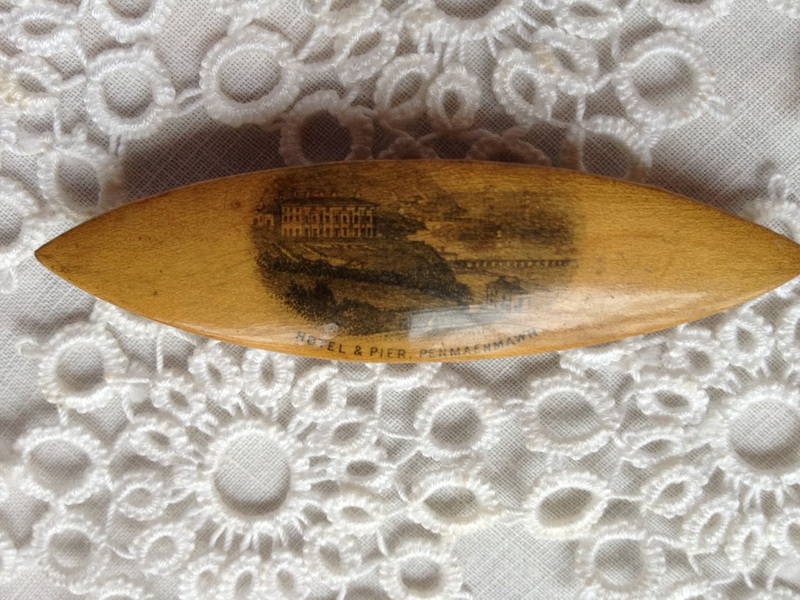 Little bit of History: 1920's Campbell, Metzger Jacobson advertised celluloid shuttles in 1920's. 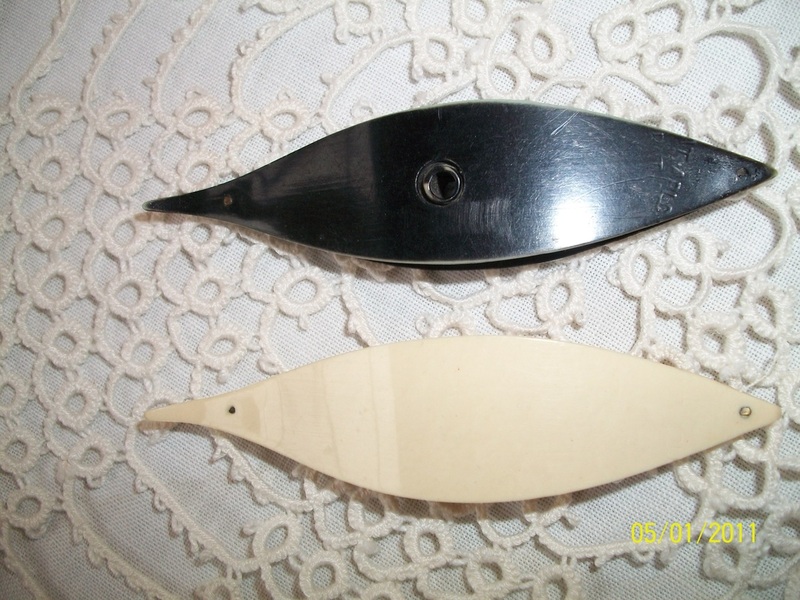 The shuttles was made in ivory, black with and without picks, and detached spools. 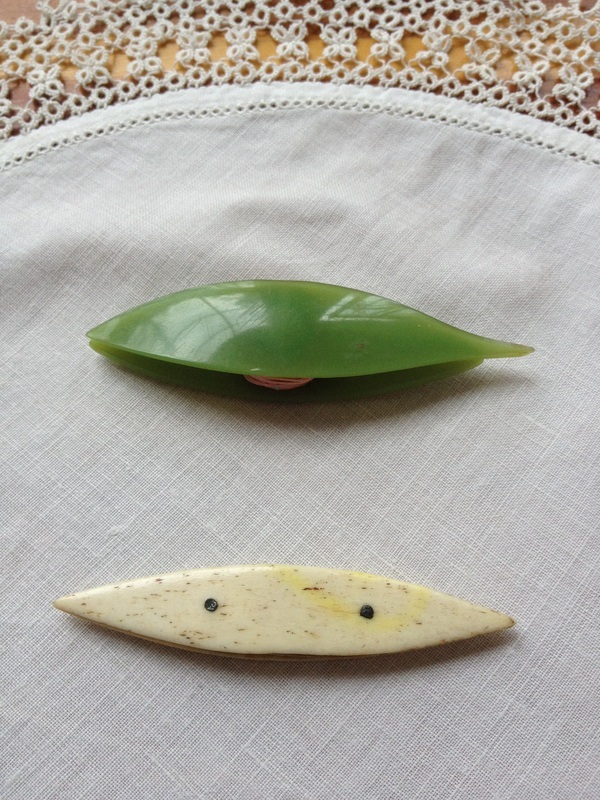 Metal shuttles sold for .20 cents and celluloid sold for .10 cents. 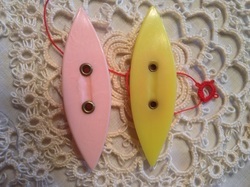 Celluloid shuttles with round sides different colors. 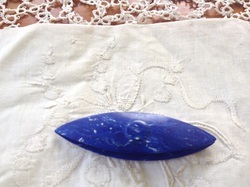 The blue shuttle was a gift from a dear friend Mrs. Peacock. Riveted Bone Shuttle from England age unknown. My newest addition to my web page will start loading from top instead of the bottom. This gift came from my mother. It is very different and not sure as to what it is made of. It was purchased in England. ALLCO is trademark for A.L. Lindroth. 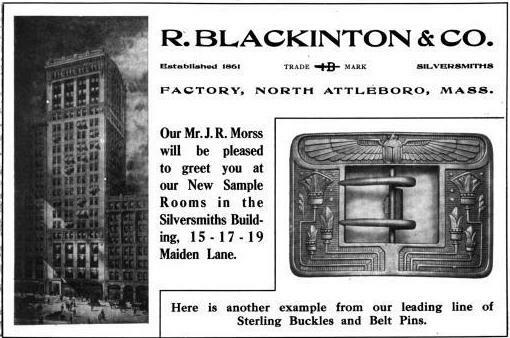 The company was in business from 1896 to 1937 in North Attleboro, Massachusetts. They also made jewelry. 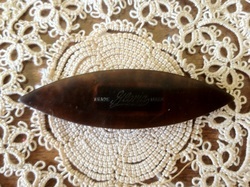 "ALLCO" marking one of my favorite shuttles, great find on my Birthday. Edwin Leach at early age served as apprenticeship in jewelry trade. He become employed by Brown & Sharp, machinery manufacturers of Providence, Rhode Island and in 1880 located to Brooklyn, New York. He took charge of Montreal Watch Company's factory. 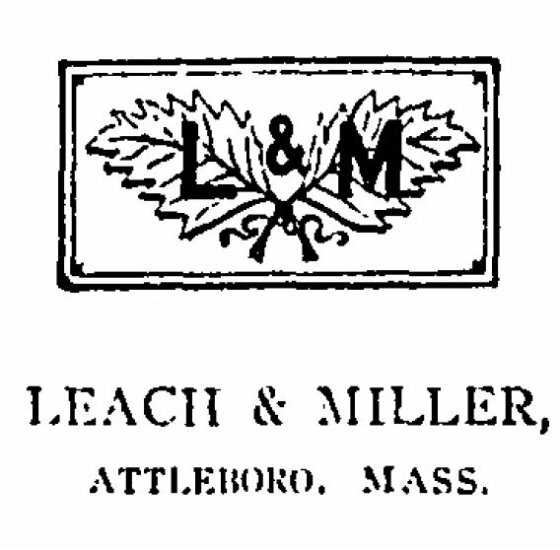 Mr. Leach returned to Massachusetts and settled in Attleboro. 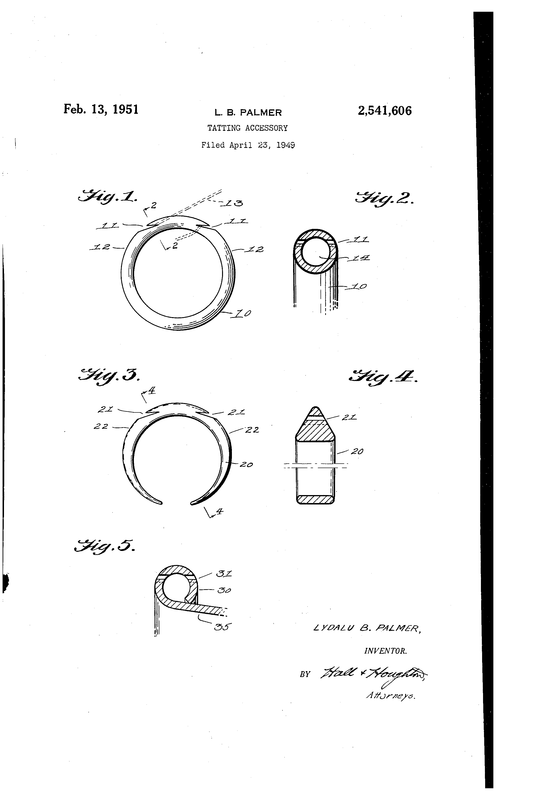 In 1902 he organized the firm of Leach & Miller specializing in manufacturing high-grade lockets and bracelets. Mr. Leach died in Attleboro, Bristol County Massachusetts on November 5, 1915. Gold shuttles Top Shuttle- Leach & Miller of Massachusetts. Heidi Nakaymama solved the mystery. She wrote Tatting Shuttles of American Collectors great book! The bottom Shuttle is gold with Hallmark ALLCO. This shuttle was know to be made in various colors including beige, black, pink with and without a hook at the end. 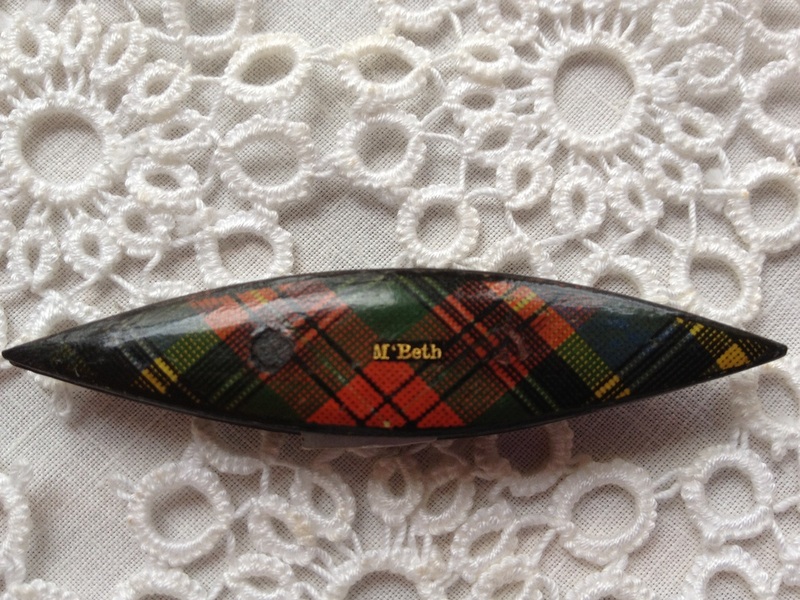 Tartan Ware from Scotland " Mc Beth"
This shuttle was bought from Tartan Dealer and is on upper end of my collection. Updated 3-8-19 " JOHN BURGESS AND SON PATENT SHUTTLE"
I've since learned that this shuttle is antique Tartan ware "Mc Beth Pattern" made by John Burgess and Son Circa 1880. I found that this shuttle was marked on inside center pillar as shown in the picture. I have had this shuttle for quite some time, but never looked closely at it. 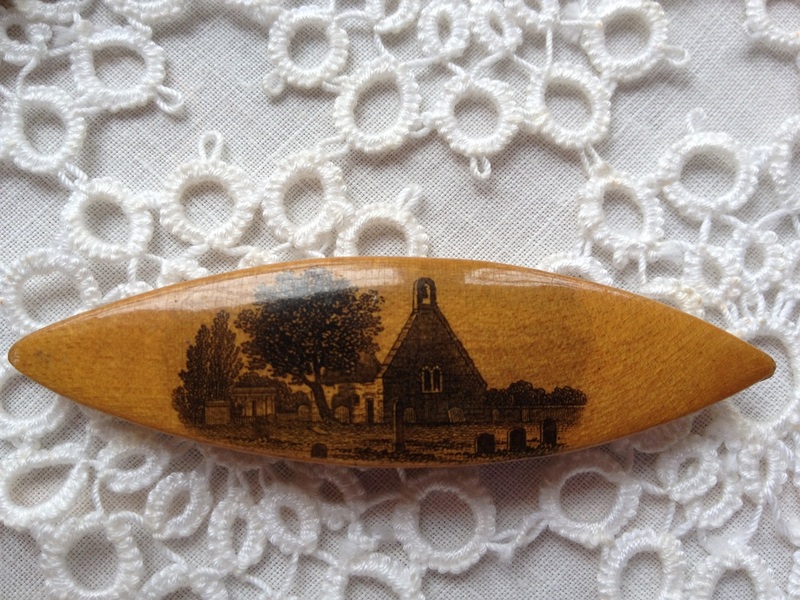 Mauchlineware Tatting Shuttle with Chruch Yard Scene on one side and the words "Made of wood grown on the banks of the Doon." from Scotland. The other Mauchlineware has hotel pier scene. Gift to me from my mother. 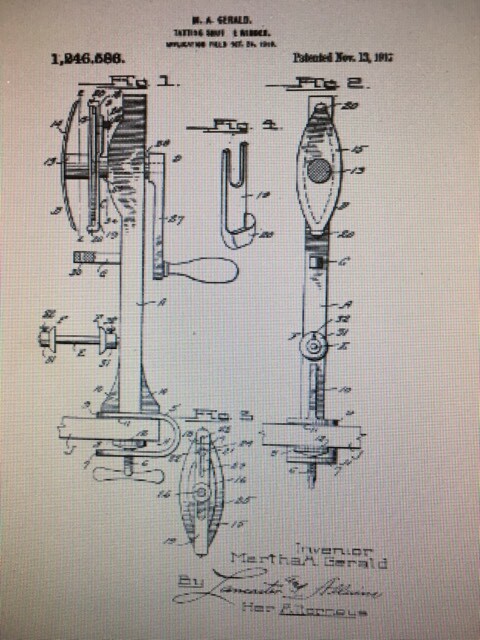 Inventor was Carlson Gustava A of Chicago Illinois assignor to The Boye Needle Company of Chicago" a Corporation of Illinois. Application was applied for May 4, 1945. The shuttle was made in different colors. The shuttle below was given to me by a shop owner. 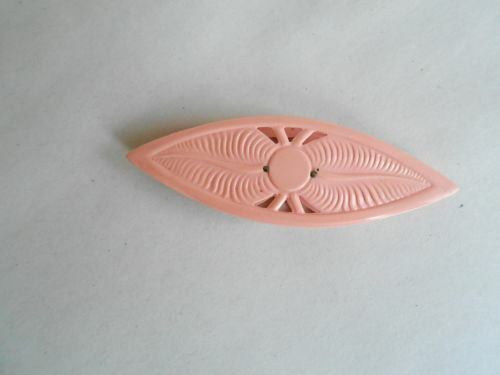 This was Boye's Company first plastic flat shuttle. It was made in white, yellow, green and red. This shuttle was made from 1947-1952 when it was discontinued and the different style shuttle was made. This shuttle was given to me by antique dealer from Gladewater,Texas who saw that I loved it so much. 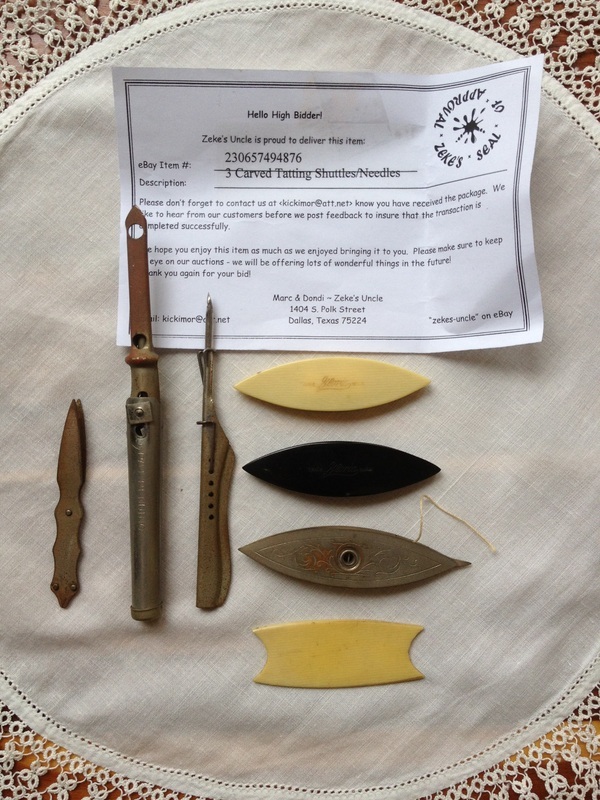 Milward Tatting shuttle made in England a gift from my Mike. 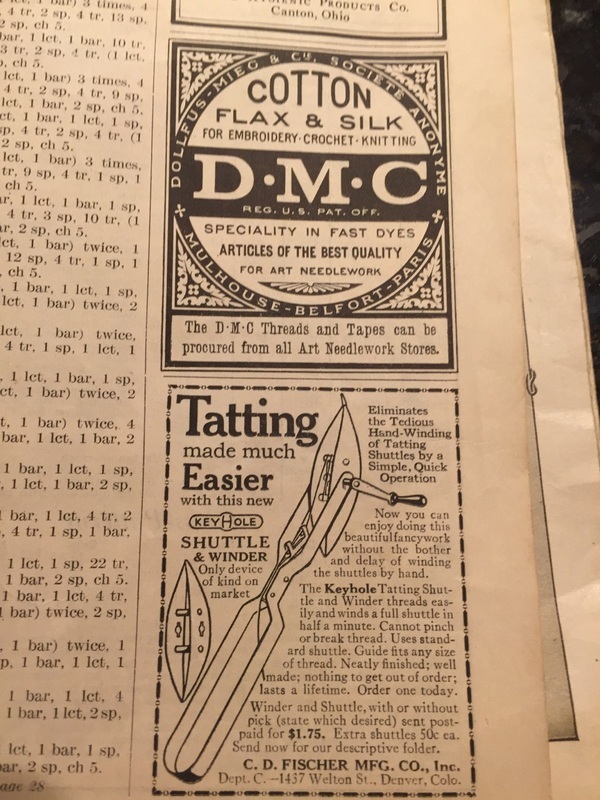 You may find pictures of Milward tatting shuttles in a book titled "Learn Tatting" printed in 1971 in Edinburgh. This book has step by step pictures of the process of tatting. 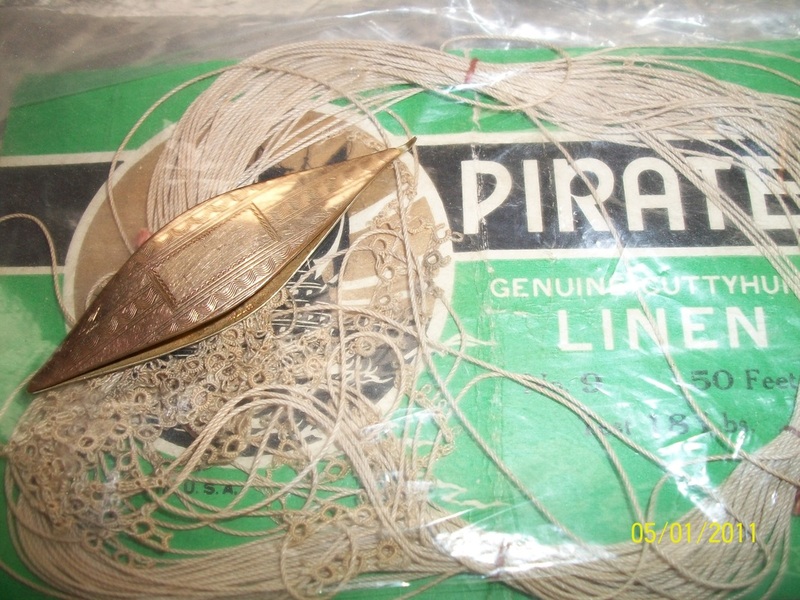 Milward shuttles were supplied in a packet and came with a separate hook for joining. 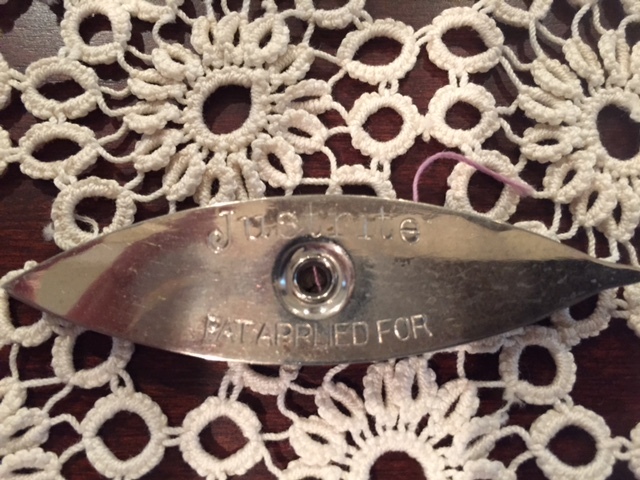 Detached- A- Bobbin- Patent by A. L. Hansen 1915- sold by Justrite Mfg Co.
​Royal Shuttles were manfactured by Justrite Manufacturing Company of Illinois. The shuttles with no hole in middle are from 1916. 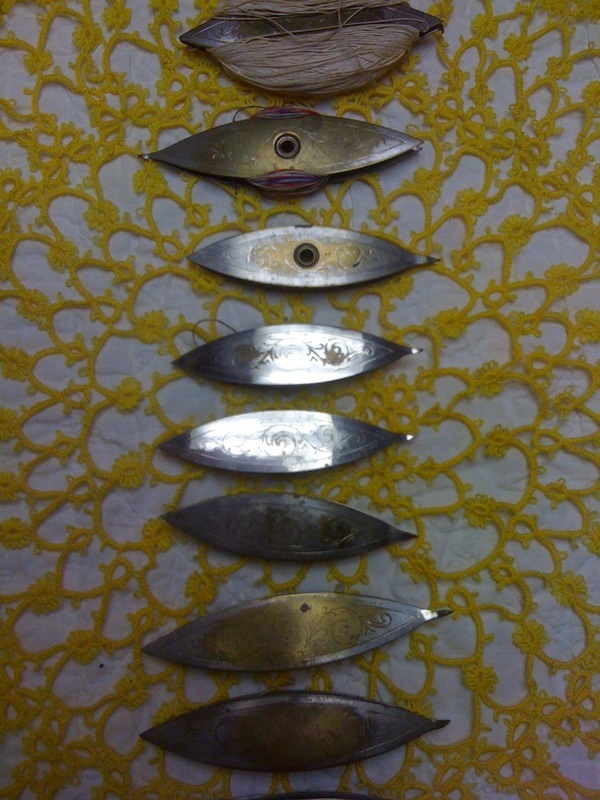 The shuttles with hole in middle are from 1930's the style change. 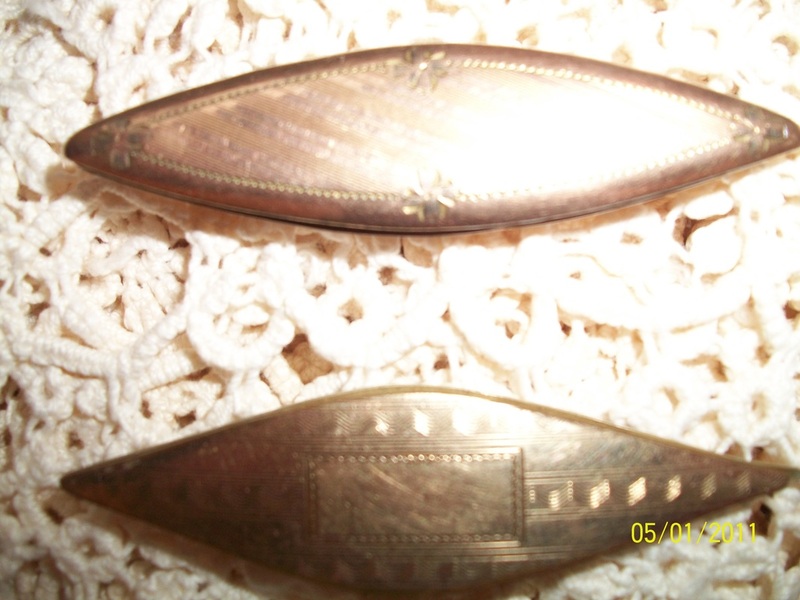 These shuttles are known for their etching art work on both sides of the the shuttles. You can still find lots of these shuttles today. Christmas Gifts 2011 see below pictures. 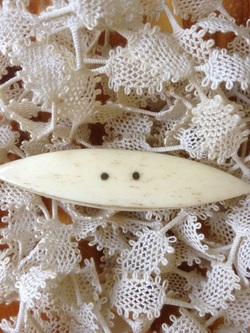 2 "Gloria" shuttles Black, French Ivory. 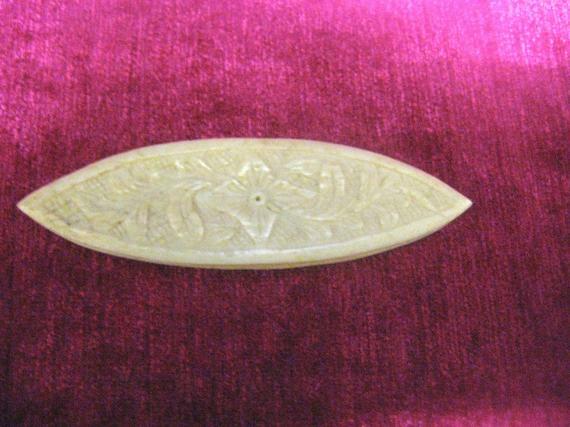 This shuttle is a beautiful Cantonese style shuttle made of carved Ivory. 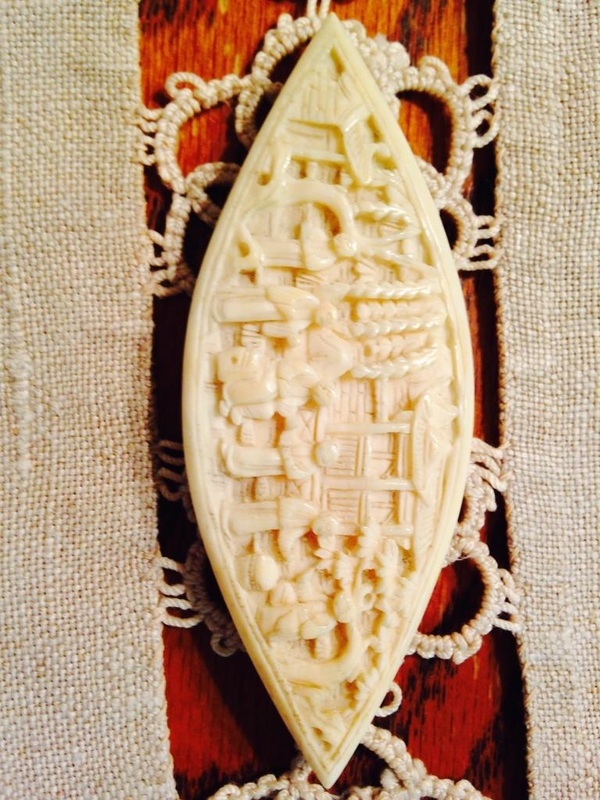 Beautiful detailed carved ivory shuttle with oriental scene. This shuttle was a Christmas Gift 2011 from my mother. She purchased it from overseas. 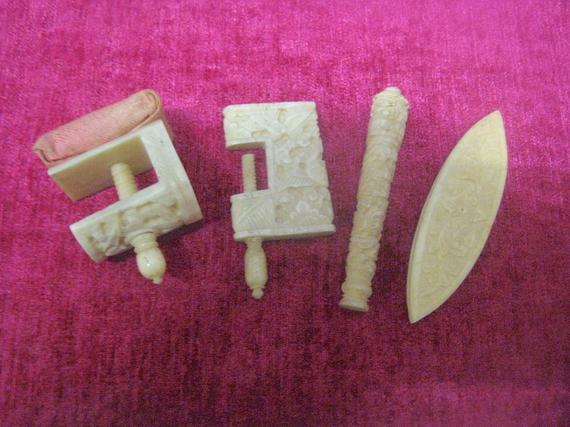 Listed as: Chinese 1800's Carved OX Bone Tatting Shuttle it came from Scotland and was purchased in 8-26-2011. H.P. Jones Shuttle Winder "Pat. June 1867" This was a Christmas Gift from my Son 12-25-11. This shuttle was purchased at the Antique Show in Tyler, Texas. The owner stated she purchased it from an Estate and had it for about 6 years. It was the first time it had been put out for a show. 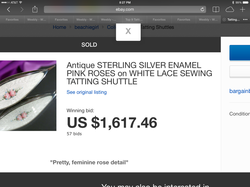 It was a good day for shopping for tatting shuttles. This shuttle was purchased 6-29-2012 from Carolyn's Antiques. She specializes in sterling silver items. My Mother is always giving early presents. She is so excited about the special gift she has chosen for my 2012 birthday. 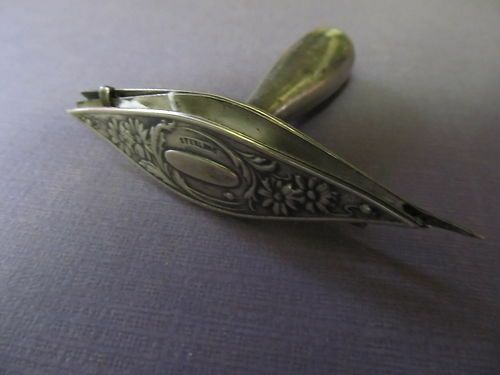 It is a sterling shuttle made by Codding Bros & Heilborn, founded in 1879. The company stopped making shuttles in 1918. She gave me the shuttle on 2-10-12, my birthday is in April. C.B. & H. Codding Brothers and Heliborn 1879 to 1918. This shuttle is special as my Mother and Husband were bidding on it. It has a very unique design. It was another gift given to me on 3-8-12. This is one of my favorite tatting books. Collingbourne first plastic shuttle 1915 "Pat. Pend." This was a gift from Mike purchased for Christmas 2011, but found it on 3-13-12. 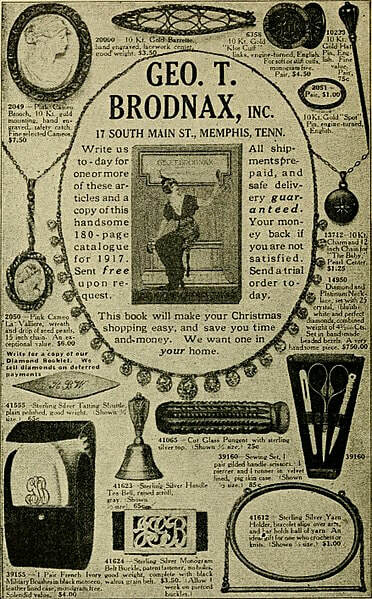 Needlecraft November 1915 talking about Bob-O-Link and what it sold for over 98 years ago. This picture was taken in March of 2015 of Rene. I was granted permission to take her picture. She loves to share her knowledge and I look forward to talking to her. 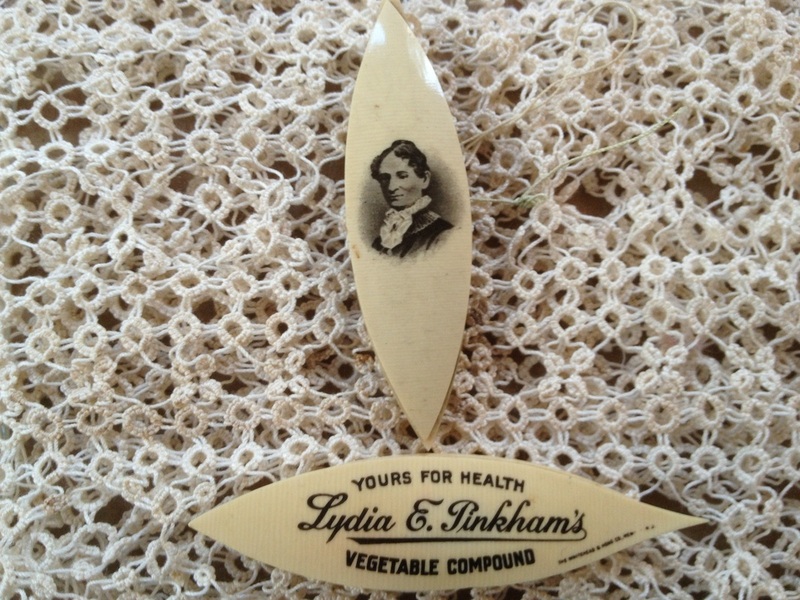 Lydia Pinkham Shuttle French Ivory made of celluliod 1917-1921 made by "The Whitehead & Hoag Company, Newark, N.J.. "Lydida Pinkham was well known for cure all-tonic. 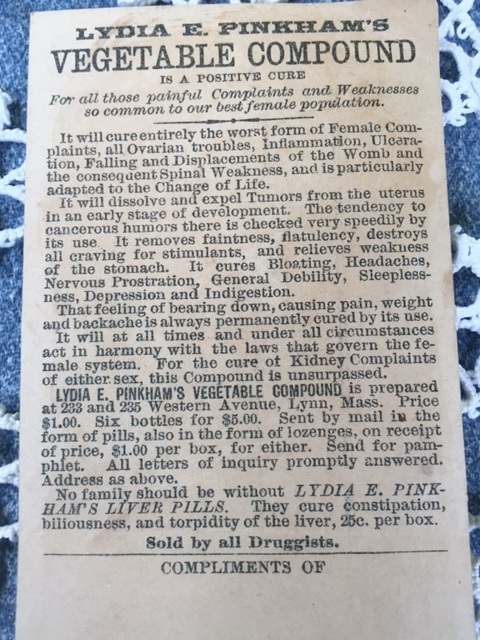 Lydia Pinkahm on one side of Shuttle and "Yours for Health" on the other side of shuttle. 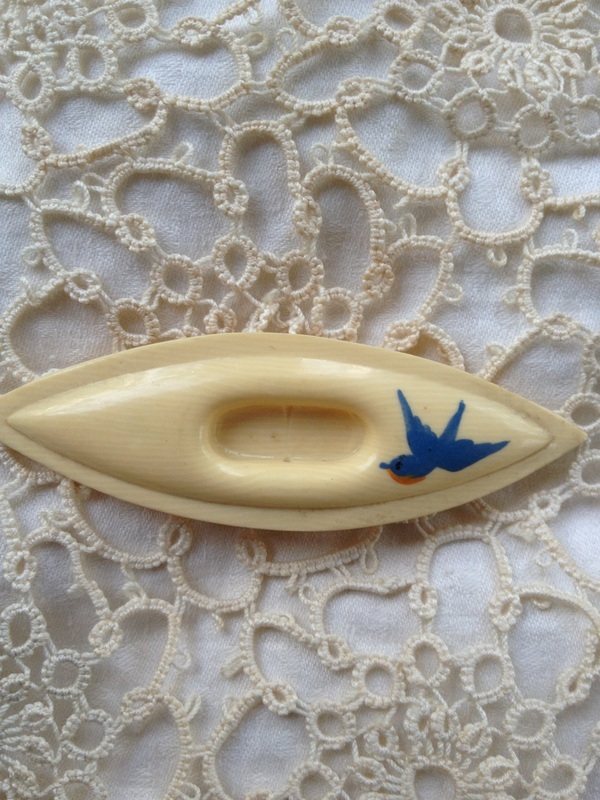 This shuttle is made by Inlaid Company with trade mark a painted swallow know by Pohlson Gifts. This shuttle was purchased April 25, 2012 by my mother and was a gift to me. I must admit the shuttle was costly. This shuttle has "Pat Pend" on the other side of it. 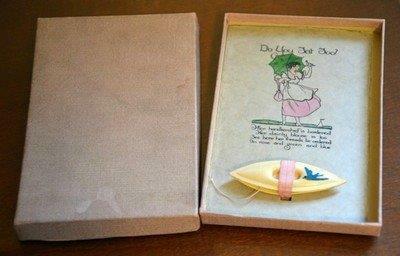 1920 ERA see pictured below of it being sold as gift box with a nice poem and shuttle and winder set. The item below recently sold on E-bay. This shuttle is not in my collection, but shows picture of how it may have been sold. This shows a little poem that was printed with the shuttle gift box. I thought this to be in great condition for it's age. Carl Vilhelm Pohlson was a dealer in fine photography and frames, he established Pohlson's Galleries and Polhson's House of Gifts on Pawtucket, RI in 1845. The gallery carried various items. The above shuttle was made by Inlaid Company of Providence, Rhode Island. 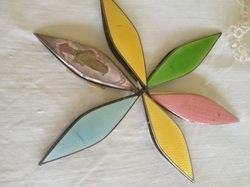 You may see the various items sold with the little blue sparrow design. 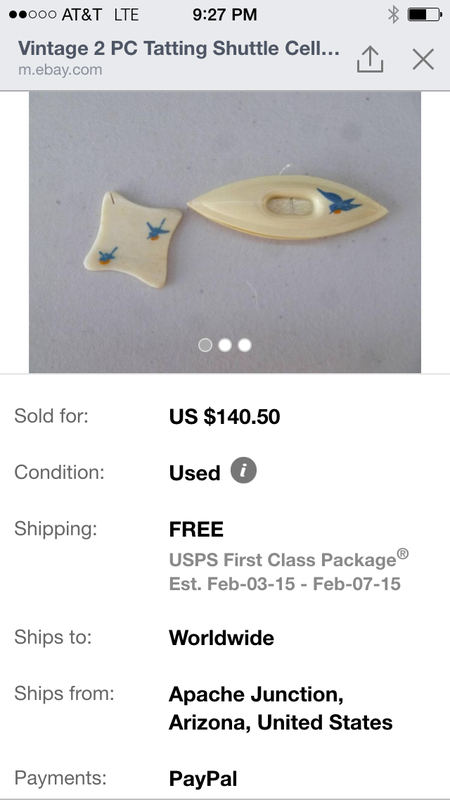 Pohlson sold the item with a wonderful little tatting poem and a little blue sparrow added to the Inlaid Shuttle. 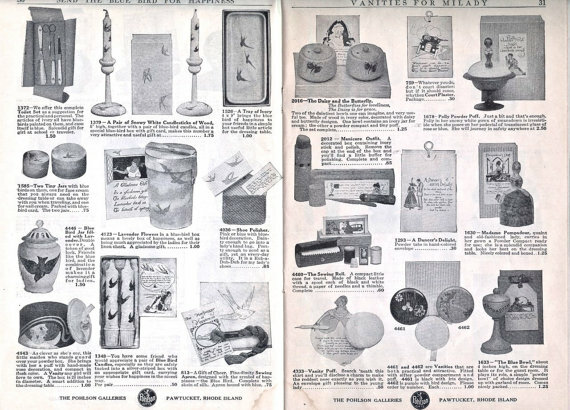 It appears that Pholson Gift may have gone out business in the late 1930's. They sold the shuttle and winder as a gift set as pictures showed. 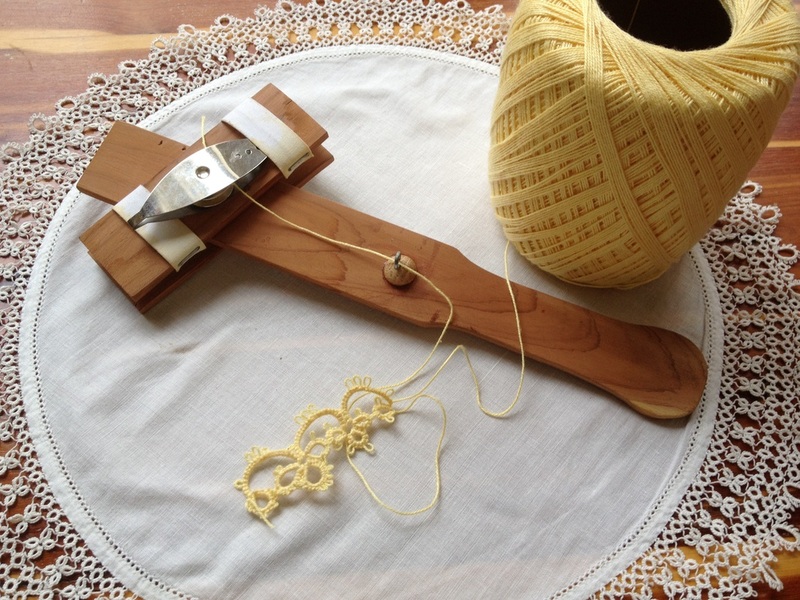 Tatting Shuttle Winder made by: James Landrum of East Texas. His mother was Susie Landrum my grandmother. He made several that were sold on E-bay you may have one in your collection. The tatting in yellow was done by me. James was my Uncle. I am pleased to have a part of his history to pass on. Some of you have his tatting stuff in your collections. He died March of 2016. 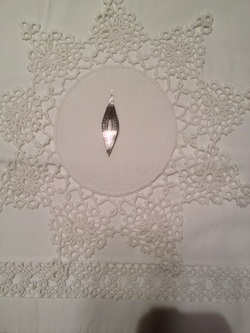 This handmade creation was done by my sons, while spending some time with their "Maw-Maw" making a special gift for me. 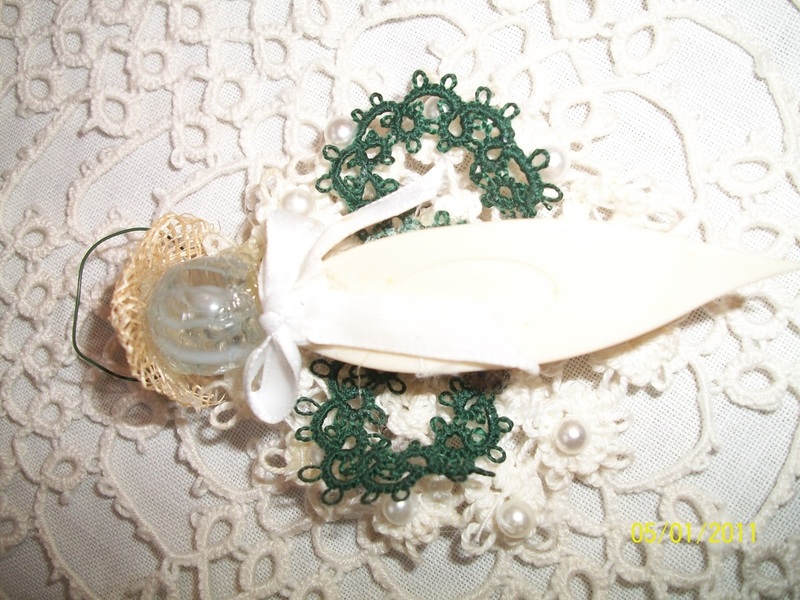 This was a handmade tatting shuttle pin with tatted wings with beads that were from my wedding. They added a vintage marble for the head. This will always be cherished by me as a special handmade gift from by boys!!! 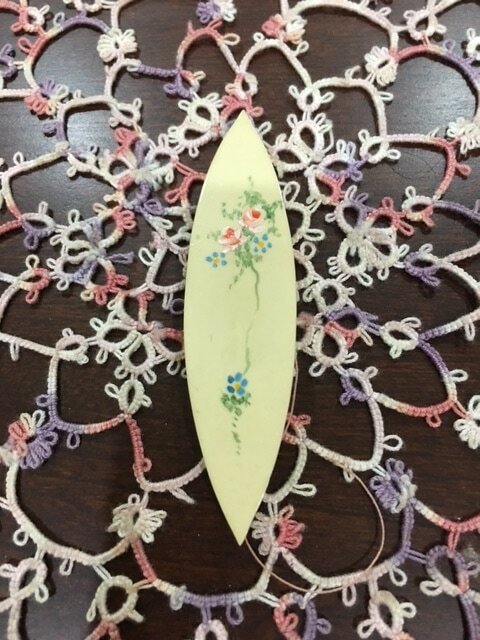 Beautiful handmade tatting shuttle. 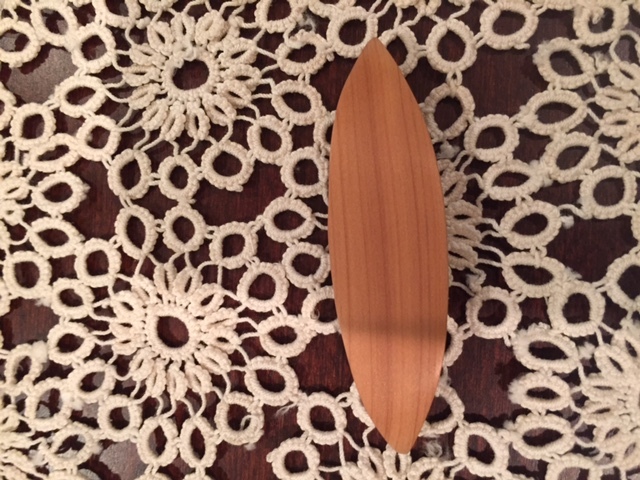 James Landrum started making these tatting shuttles in April of 2000. 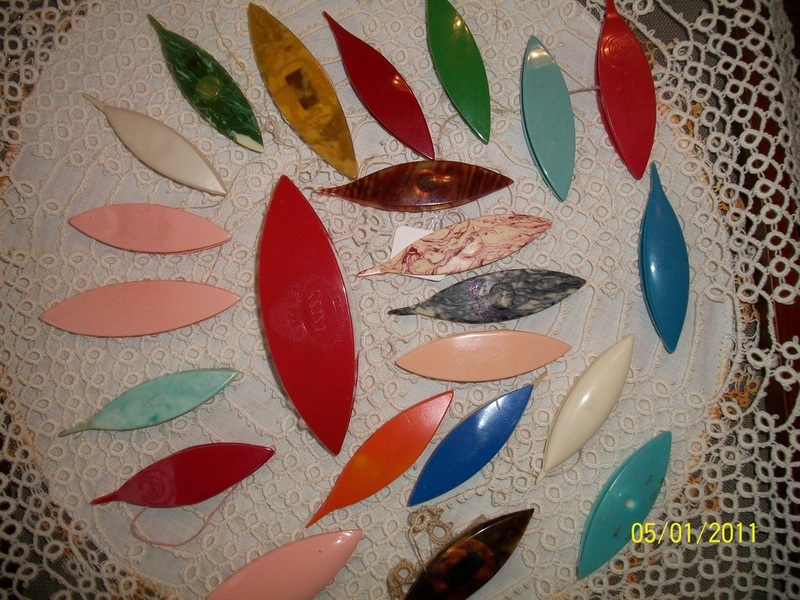 He started making tatting shuttles in memory of his mother my grandmother Susie Landrum. She taught herself to tat while sitting under the shade of tree. 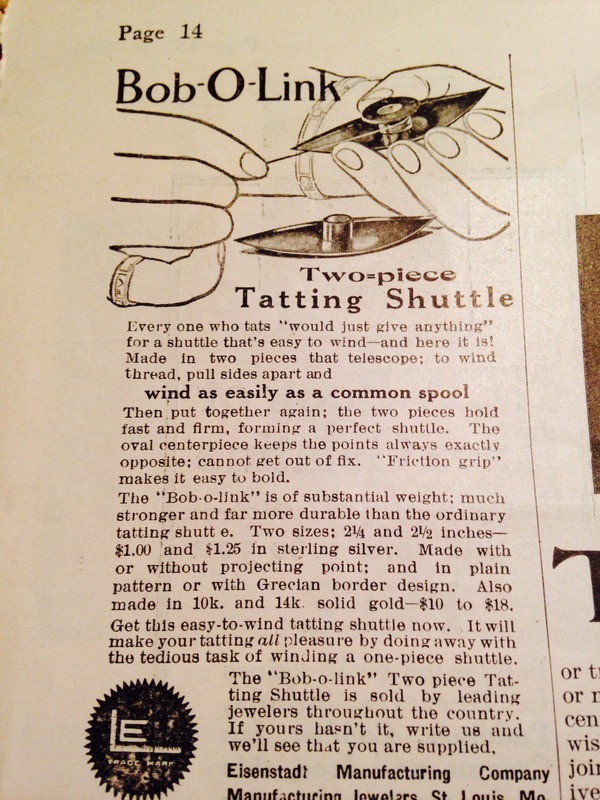 Some people could not afford tatting shuttles in the early 1900's. That would have been a luxury that was unnecessary. So she took a tree branch and sharpened it to a point on the end. Wrapped her thread around the branch and started tatting. She did beautiful work her legacy lives on. This shuttle is made of deer antler. Several of them were sold. I started going thru some of my communications and found an old e-mail from someone from Auburn, Washington. 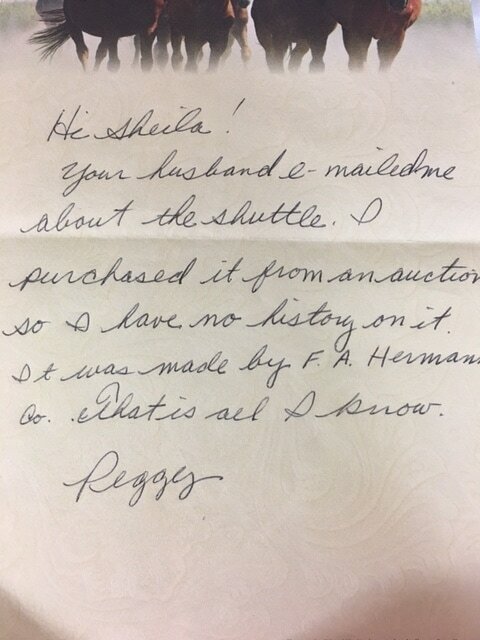 They purchased a shuttle for their collection asking for the History. In 2000 I was not as interested in collecting and documenting the history as I am now. When she e-mailed in 2000 her collection was over 500 different shuttles! This shuttle sold for $104.50 on April 9, 2000. This shuttle was made by James Landrum out of Steer's Horn. He made several of them. A shuttle like this without my grandmother's name sold on E-bay for $82.01 on 4-20-2000. He made this shuttle special for me!! !